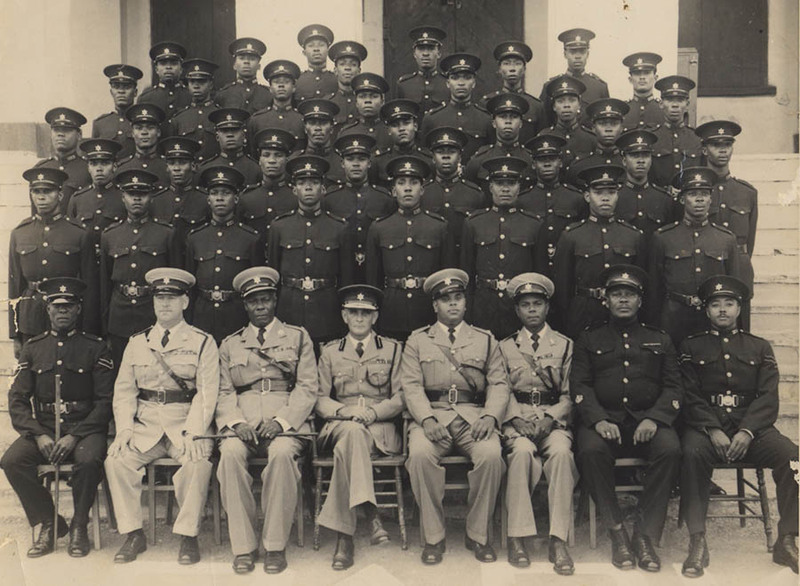 The Trinidad & Tobago Police Service is the oldest public institution in Trinidad & Tobago. Founded in 1592 under the Spanish government, it has served this country for some four hundred and twenty-five years. 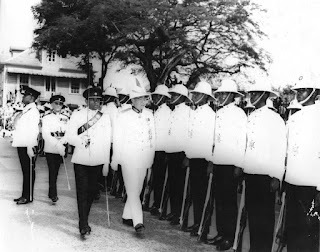 Except for a brief three-year period between 1839 to 1841, when it was disbanded so as to be re-organised, the Trinidad and Tobago Police Service has been on continuous duty. Its origins date from the time of the third Spanish Governor of Trinidad, the conquistador, Don Antonio de Berrio y Oruña (1592-1597), who founded San José de Oruña, the first capital of Trinidad. He appointed Senor Josef Nunez Brito to the office of Alguacil Mayor, he was the first Chief of Police. This was a very long time ago: this was when Sir Walter Raleigh visited the Pitch Lake, 1592 was the birth year of Shah Jahan, the 5th Mughal Emperor of India, famous for the building of the Taj Mahal, and when Queen Elizabeth I reigned in England. in Chaguaramas Bay in 1797.
and during the period when Trinidad was placed under the control of commissioners, Colonel Fullarton, Colonel Picton and Commodore Samuel Hood R. N., 1803–1804. And presently, under the laws of the Republic Trinidad and Tobago. 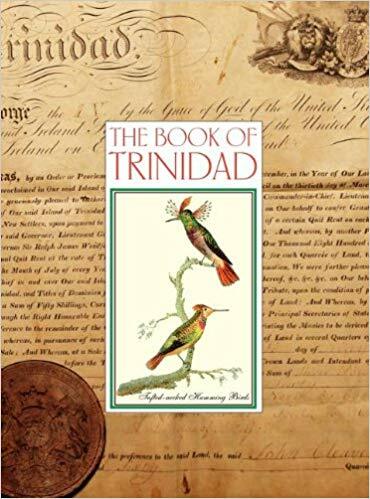 For the majority of the Spanish period, 1492 – 1797, Trinidad was a virtual desert island, in that it was slowly depopulated of its original native inhabitants while never actually developed by its coloniser, Spain. Tobago during this period, the late 16th century to the beginning of the 19th century, was an often fought-over territory that was controlled by local militias and troops stationed there to protect the property and interest of the various European governments who, at one time or the other, controlled the island. In spite of having a very small population, Trinidad never lost its Spanish presence. There was always a Spanish governor, as it formed a part of the Vice-Royalty of New Granada. There were thirty-seven Spanish governors from 1530 to 1797. There was as well a civil administration, who were in charge of the police. This was the Illustrious Cabildo, a form of town council, in place at the island’s capital San José de Oruña and in later years in Port-of-Spain. We are told by historian Carlton Ottley that during this period there were never more than six policemen in Trinidad. The fundamental change that took place in Spanish Trinidad was the promulgation of the Cedula for Population of 1783. This saw the arrival of colonists, mostly from the French islands of the Caribbean, who introduced chattel slavery to Trinidad on an industrial scale. 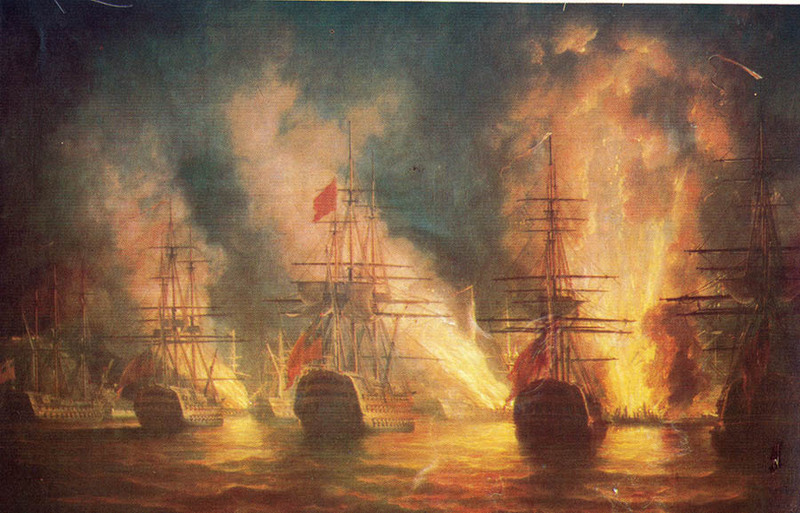 Trinidad, from the start of the French Revolution of 1789 to the conquest of the island by the English in 1797, experienced a period of civil upheaval, public disorder verging on anarchy and the threat of foreign invasion. 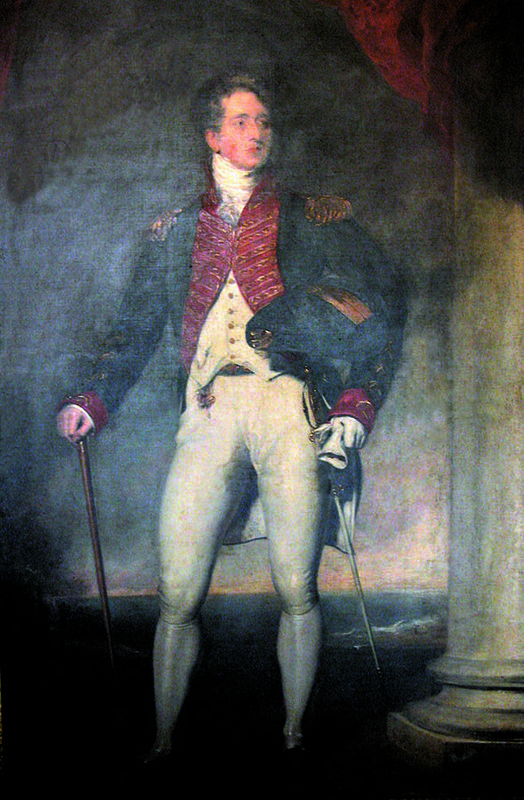 With the English conquest of Trinidad in 1797 and the appointment of Colonel Thomas Picton, a Welshman, as governor, the nature of policing in Trinidad changed again, this time radically. 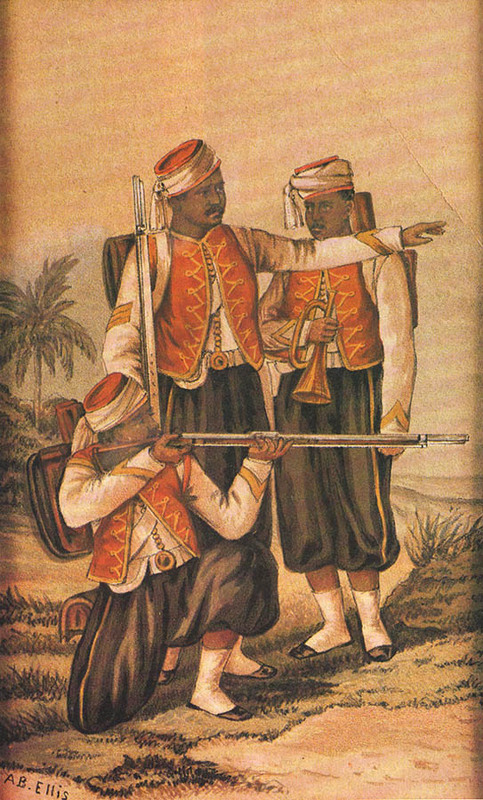 Because of his soldiers’ predilection to tropical diseases and rum, Picton put his few European troops into garrison and relied on black troopers seconded from Colonel Drualt’s Guadeloupe Rangers, the 9th West India Regiment, who had been fighting Victor Hugues in Guadeloupe, and from Lieutenant-Colonel Gaudin de Soter’s Royal Island Rangers, the 10th West India Regiment, to form the core of Picton’s Royal Trinidad Rangers. Lieutenant-Colonel Gaudin de Soter “A company was raised by my son under the direction of general Abercrombie, and left to the order of general Picton, for the purpose of aiding in the preservation of tranquility in the colony”. (From de Soter’s testimony at Picton’s trial.) Gaudin de Soter was a French Royalist officer who had joined the British in the fight against French revolutionary forces in the Caribbean. 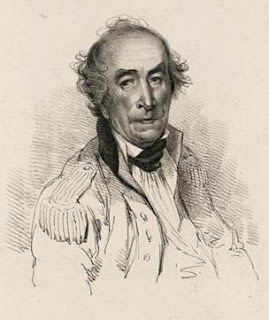 His Royal Island Rangers, later the 10th West India Regiment, comprised of Free Black and Coloured men, were placed under the command of Governor Thomas Picton by General Abercromby. 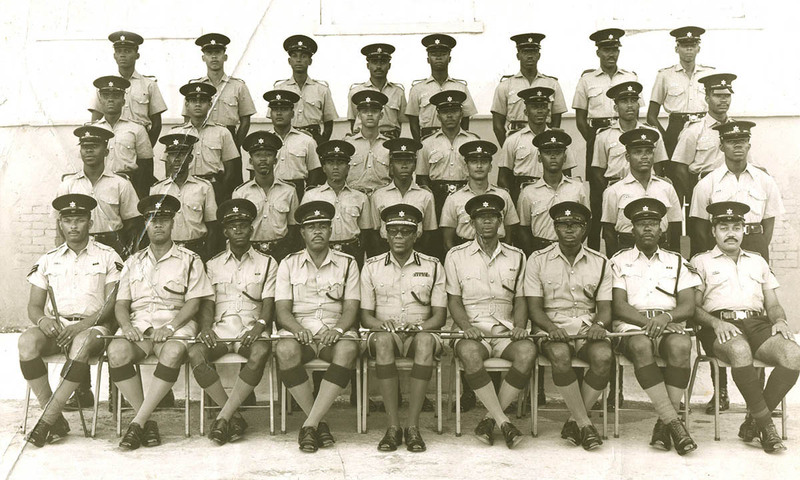 This contingent became the core of what would evolve to be the Trinidad and Tobago Police Force. Historian, Roger N. Buckley, in his ‘Early History of the West India Regiments’ tells us that “Apparently most of the first recruits for these corps were free blacks and free mulattoes. Many of the officers were French and the pay of these corps was the same as for British regiments. 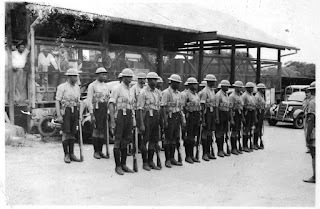 Among these corps were Soter’s Royal Island Rangers, which was raised in Martinique, and Drualt’s Guadeloupe Rangers.’” Thus the precedent for the recruitment of West India Regiment soldiers into the Trinidad Police Force was set. These recruits also operated his sloop of war, the H.M.S. Barbara, as Picton’s Marine Police Force. 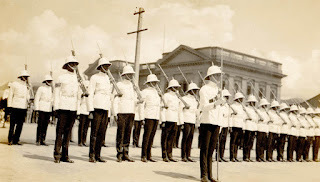 Picton’s police, the Royal Trinidad Rangers, a composite of the above, comprised a uniformed element who patrolled the town of Port-of-Spain and paid particular attention to the waterfront, as well as a secret service, who operated in Trinidad and Venezuela. These early irregular troops, navy, and police were paid out of Picton’s private funds until 1802, when they were granted official recognition. During this period, Picton’s Royal Trinidad Rangers took to wearing, as a badge, a six-pointed star which they identified with Picton’s patron saint, St. David of Wales, as their own emblem. 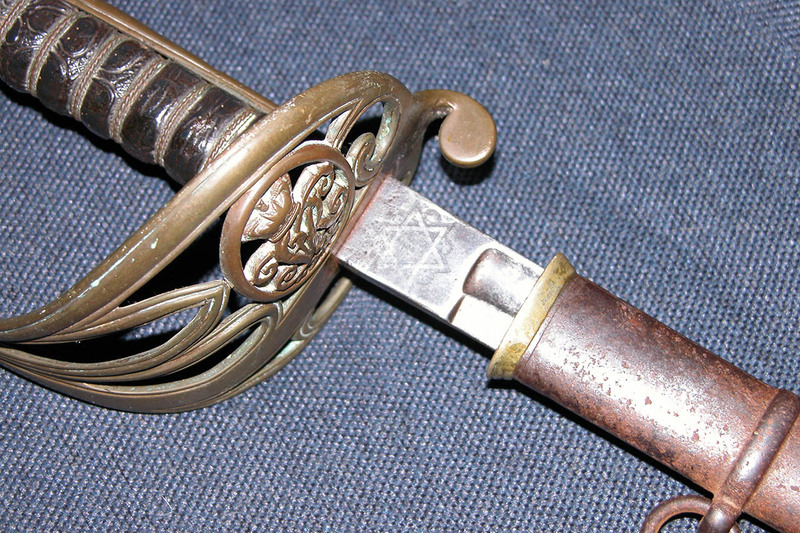 In 1802, the six pointed star became the official badge for both the Militia and Police, which is still used today. Shako plates and gorgets, once part of the uniform of the Militia, dating from 1802 to 1842, exist in the Military Museum in Chaguaramas. The police under Picton enforced British martial law supported by the Spanish Laws of the Indies with draconian effect. There were public executions, torture in the Royal Gaol, public floggings and mutilations inflicted on criminals and on those suspected of sabotage. 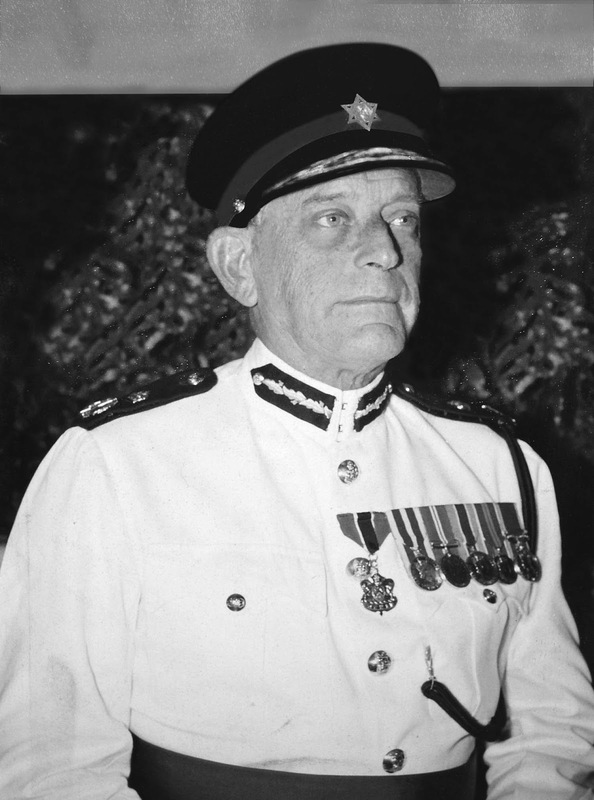 Brigadier General Sir Thomas Picton, as he was to become, was the founder of the modern Trinidad and Tobago Police Service. The use of the six-pointed star as a cap badge for locally commissioned officers only, was continued in the First Division until 1938-39, when under the command of Colonel Walter Angus Muller, the first Commissioner of Police, it was introduced to all ranks as a cap badge. 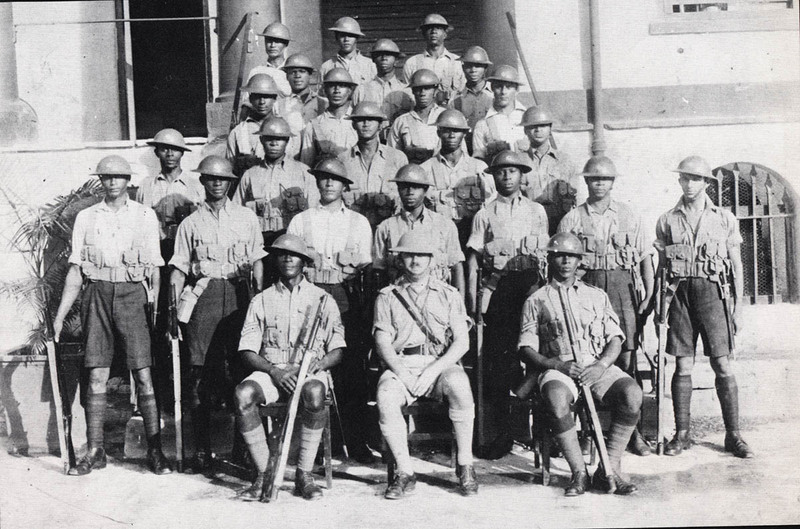 British officers who were assigned to the Trinidad Police used the cap badge and other insignia of their regiments. 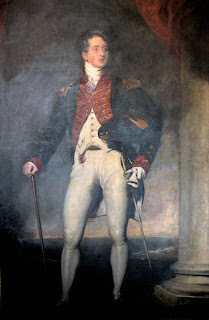 Picton’s successors, Brigadier-General Sir Thomas Hislop, 1804-1811 and Major-General William Monro, 1811-1813, imposed law and order to control the still unruly populace. Their most constant preoccupation, apart from invasion by Republican France, was the possibility of slave uprisings on the estates, as resistance, by the enslaved had been the trigger for rebellion in other islands. This was a genuine concern, because with the abolition of the slave trade in 1807, the planters, fearing that their supply of free labour was going to end sooner rather than later, worked the chattel slaves cruelly and in many instances to death in an attempt to recoup their investment and make a profit. 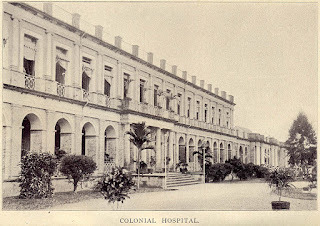 was built in 1804; it is now the General Hospital in Port-of-Spain. The Orange Grove Barracks, now the General Hospital, and Fort George were built during the tenure of Governor Hislop in 1804–11. Fort George to defend the harbour and to offer safe haven to the citizens and Orange Grove Barracks to house regiments stationed here during the period of the Napoleonic wars (1803–1815). This made up a free population of seven thousand five hundred and thirty-six, with the Free Black and People of Colour being in the majority. With the emancipation of the enslaved throughout the British Empire in 1838 a new dispensation for the civil society of Trinidad and Tobago commenced. This necessitated the disbanding of the previous policing regime, ending the authority of the corregidors, and a reorganisation of the police establishment in the colony. On the 13th of August, 1838, an ordinance to establish a rural system of police was proclaimed. This new ordinance created new police districts, excluding Port-of-Spain. They were St. Joseph, Eastern district, Carapichaima district, Naparima district and a Southern district. 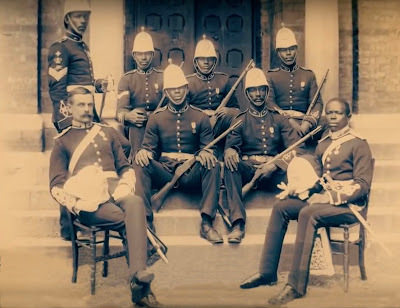 The reorganisation of the police, by the end of 1842 saw the creation of the posts of inspector, two sub-inspectors, one in Port-of-Spain and another in San Fernando, ten sergeants and seventy-two constables. There were now twelve police stations. Reflecting the society, indeed the western world at the time, that was convinced of the superiority of the Europeans, all commissioned officers were British. became an integral part of the regular British Army. its attire to a uniform modelled on that of the French Zouaves. An event that would change the make up of the population of the colony was the arrival of indentured East Indians. 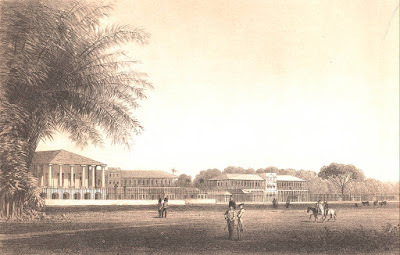 The newcomers, arriving from 1845 to 1917 to work on the sugarcane estates, were at first hardly noticed, but would become an object of interest to the commanders of the Force in the years following the Indian Army Mutiny of 1857 that was made infamous by stories of massacres of English people and the notorious Black Hole of Calcutta. 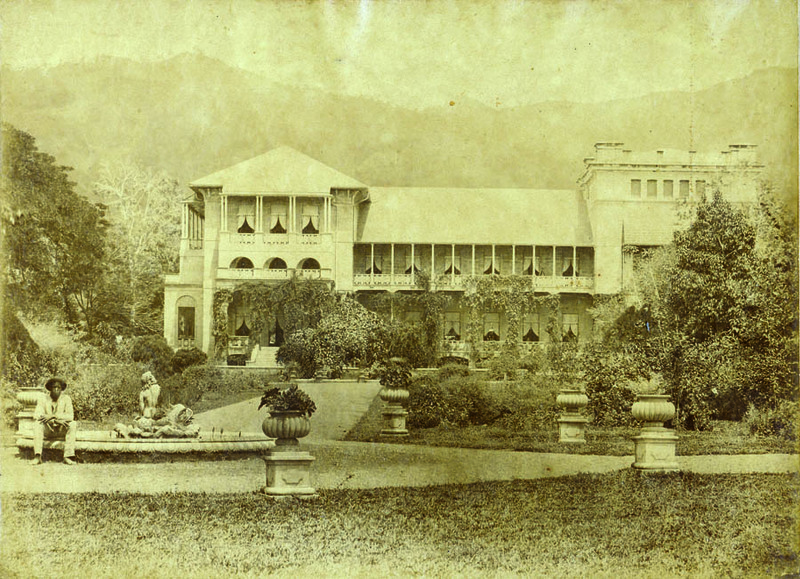 It was believed by the authorities that the East Indians, who were almost entirely sequestered on the cane estates, could somehow become aroused and moved to violence on a mass scale. 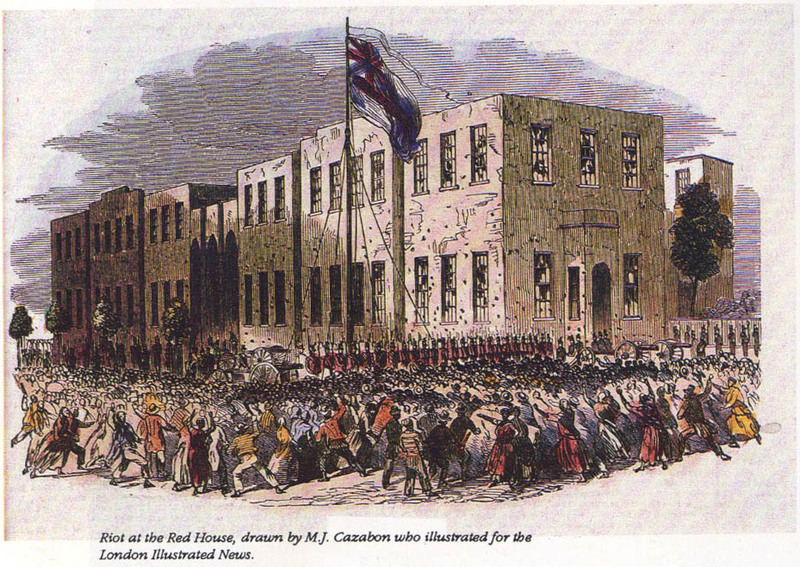 Rioting outside the forerunner of the Red House in 1849. 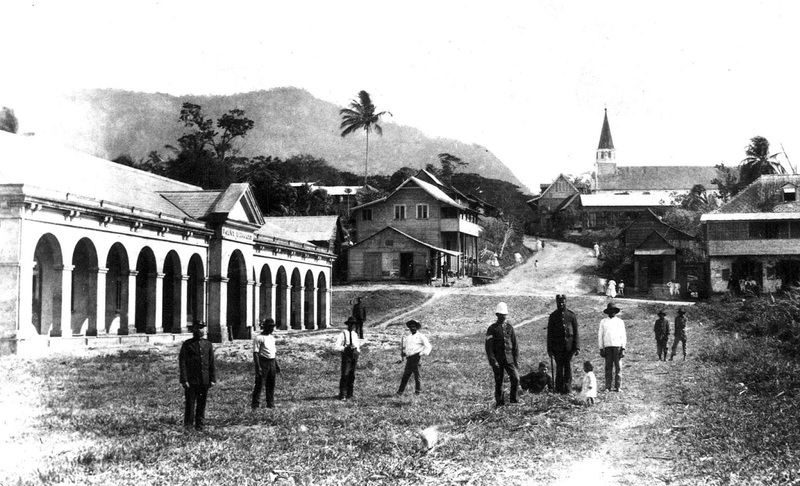 St Vincent St., Port-of-Spain, built 1876.
the police stare was in use in Trinidad. continued to attack the police. 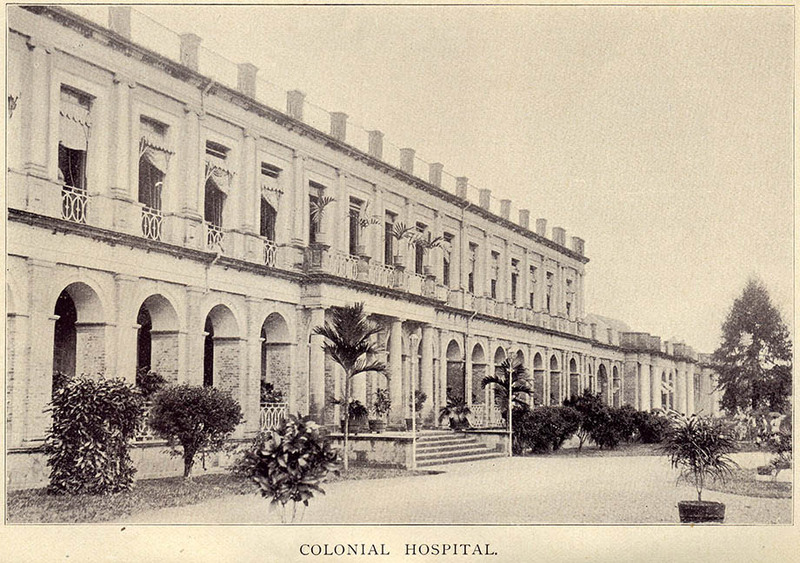 During the night other buildings were attacked and buildings on sugar estates in the environs of the town set ablaze. 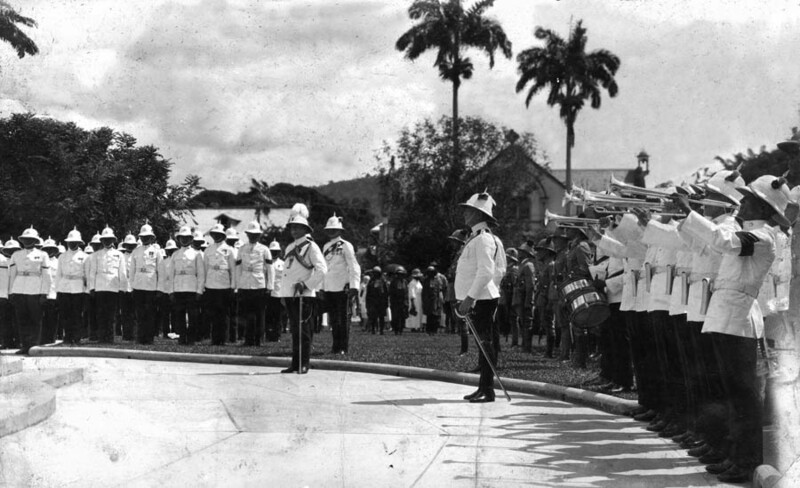 The governor, Lord Harris, understanding that the police could not deal with the escalating situation, called in the 88th Regiment, and a company of the 2nd West India Regiment from Barbados and with the aid of some six hundred special constables, sworn in, and a volunteer horse patrol, of seventy strong were assembled to patrol the streets of the town. Irish Non-Commissioned Officers and Constables. The need for another “remodelling the Force” became urgent after the events of October 1849. 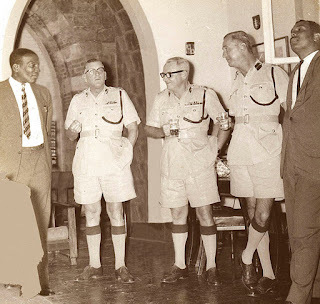 The population had expanded to include West Indians coming from the other islands as well as people from various parts of Europe who were fleeing war and starvation, many of whom did succumb to drink and riotous behaviour. 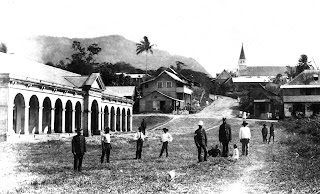 There was as well a growing and marked sense of individualism that expressed itself in an expanding community of people who lived mostly in east Port-of-Spain, who saw themselves as belonging to a parallel society, ‘a hoodlum element’, with gangs that engaged in brawls, stick fighting, cockfighting, drumming, prostitution, the creation of ribald songs, and vulgar, outrageous and at times dangerous behavior. This was the crucible of the Jamette class that would keep the carnival spirit alive, in spite of the opprobrium that was heaped upon it by polite society and express it in Cannes Brulées carnival at a later date as a form of resistance to authority. With the growing industrialisation of agriculture, an expanding railway, a prosperous commercial sector, imposing government buildings and an increasing middle-class, there was more valuable property and important persons to safeguard and protect. 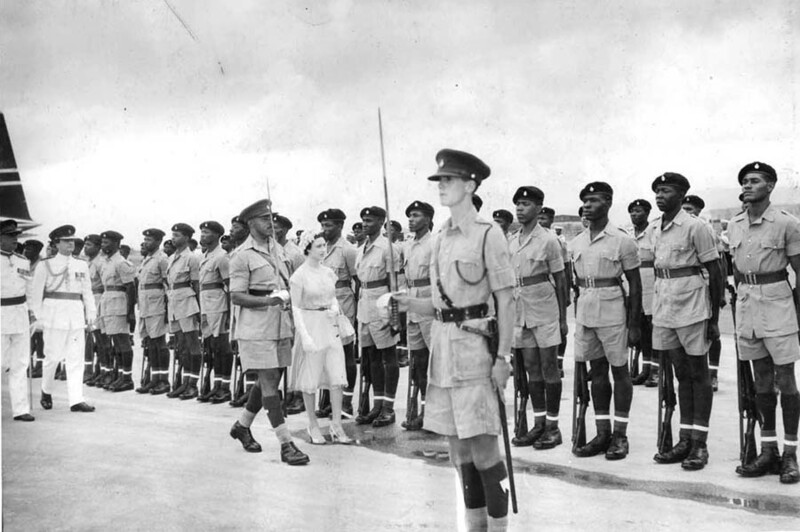 As a result, this period saw the Force being manned increasingly by ex-service men from the West India Regiments that had been raised in West Africa as well as men from British regiments who had been discharged in the region after their tours of duty had expired. 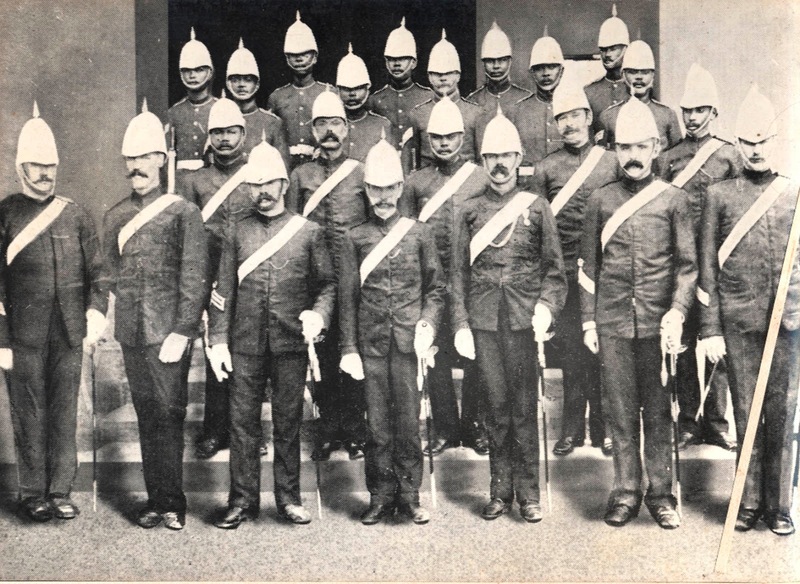 The look of the rank and file of the Trinidad Police Force towards the end of the 19th century was multi-racial. 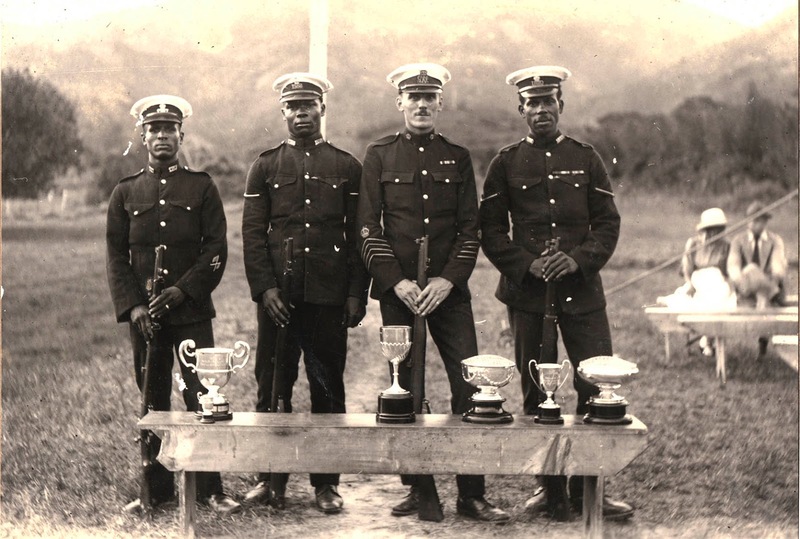 in 1890 to the Trinidad Constabulary. It had become popular after the Anglo-Zulu War. around it, and small holes for ventilation. 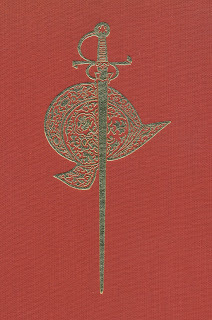 a brass spike or ball-shaped finial. brass chain, depending on the occasion. 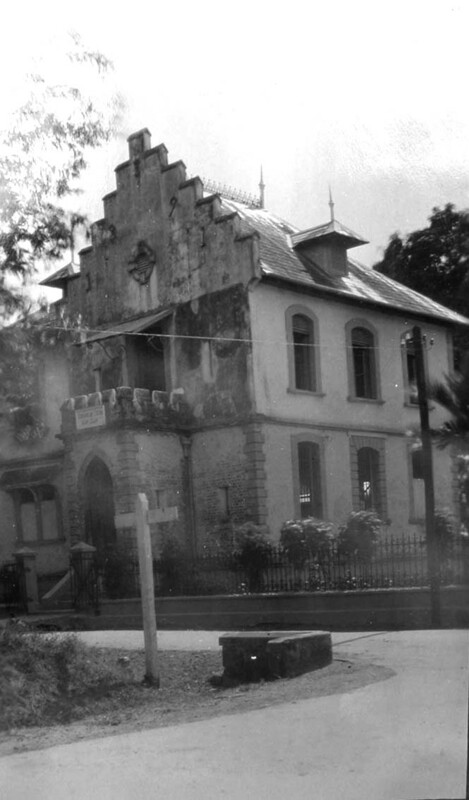 Carlton Ottley informs us that “In the 1840s Police Headquarters was housed in a building at the corner of Abercromby and Hart Streets, it would later be converted into the Fire Brigade Station. From 1859 to 1865 Henry Grattan Bushe commanded the Force, he was succeeded by Lionel Mordrent Fraser who served from 1865 to 1889. 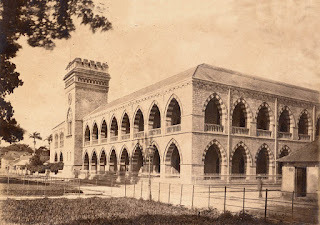 It was during his tenure that the Police Headquarters, the Port-of-Spain Depot, was built, this was in 1876.
drawn up outside the Princes Building. 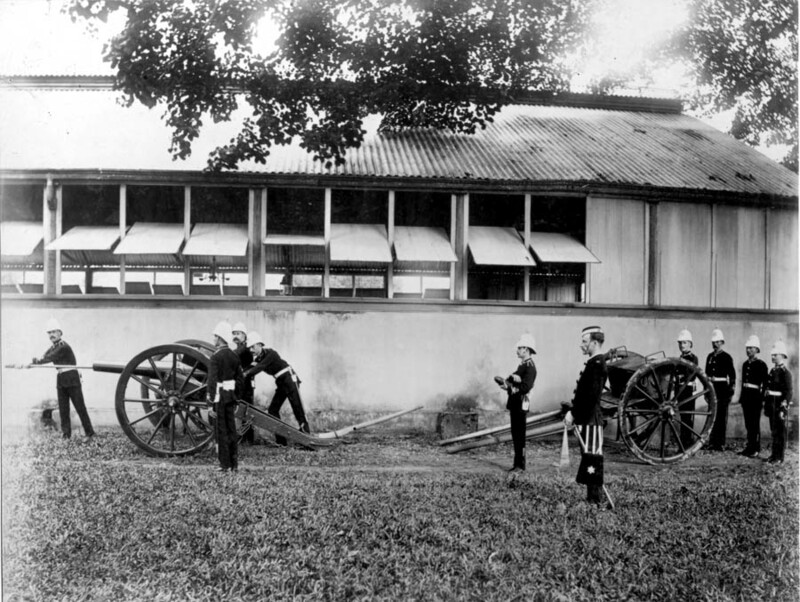 at St James Barracks in the 1900s. Members of the Trinidad Light Artillery, photographed in England wearing the Diamond Jubilee medal. 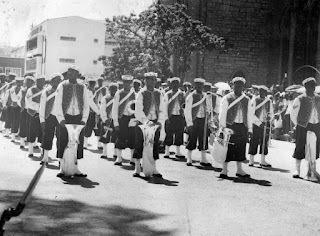 They were a part of the Trinidad Jubilee Contingent for Queen Victoria’s Diamond Jubilee Celebrations in England in 1897. 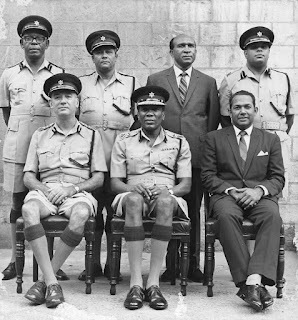 The officers seated are Captain A.C. Rooks (left) and Lieutenant Mzumbo Emmanuel Lazare. 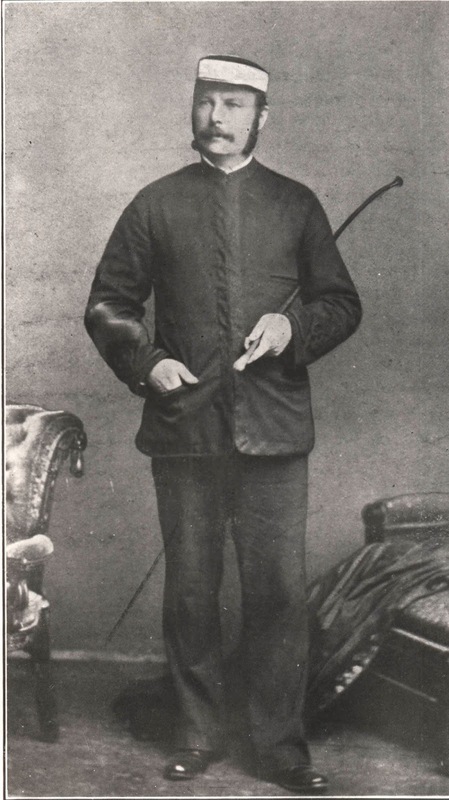 Inspector Brierley came to Trinidad in 1874 to join the Police Force. 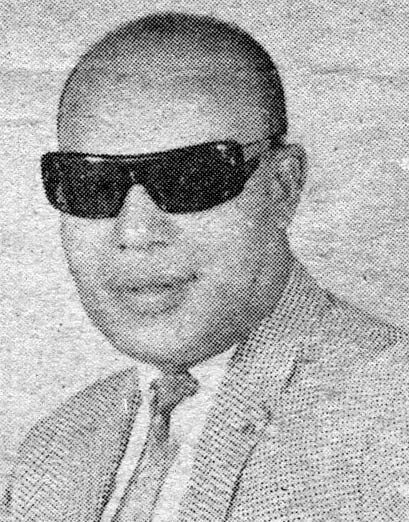 Making a name for himself as a detective, he became senior inspector and was instrumental in laying out San Fernando and Port of Spain into beats. Historian Fr. Anthony de Verteuil recounts that he traveled extensively to all parts of the island on horseback, giving lectures and instructions. Amongst those Irishmen who settled here at this time were Farrell, Darcy, Costelloe, Fahay, Flynn, Murphy, and Fraser. A detachment in ‘Marching Order’ kit in barracks, note mascot. 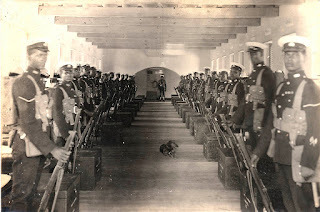 In ‘Marching Order’ kit, note Lewis machine gun at left. become resentful of the institutionalised racism and the inequality, the lack of opportunity that pervaded every aspect of life, and for not only the poor in Trinidad and Tobago. The authorities, mindful of the fears of the ‘respectable persons of all classes’ of a general uprising of the blacks, which had been inherited as a memory of slavery, now became alarmed by a section of the East Indian community who produced the Hosay festival annually. 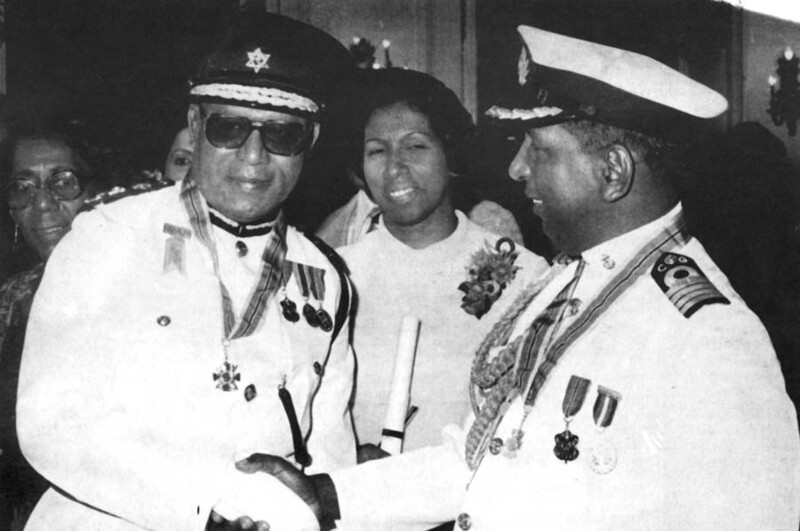 The authorities believed that there was cause for a strong, armed and disciplined force to guard against what was thought to be dangerous elements within the Indian community on the cane estates, as well as the blacks in the overall urban society. Trinidad & Tobago Constabulary on parade. This period of insecurity in the colony saw the commanding officers, Inspectors-General of the Trinidad Constabulary, drawn from the Irish Constabulary that had been created expressly for the suppression of the Irish nationalists. 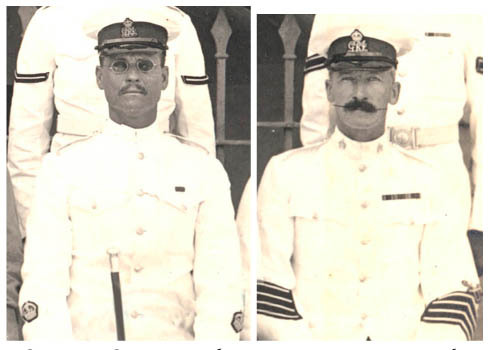 Captain Arthur Baker, 1877–1889, Captain Edmund Fortescue, 1889–1898, and Major-General Sir Francis Scott, 1898–1902, were Inspectors-General of the Trinidad Constabulary. 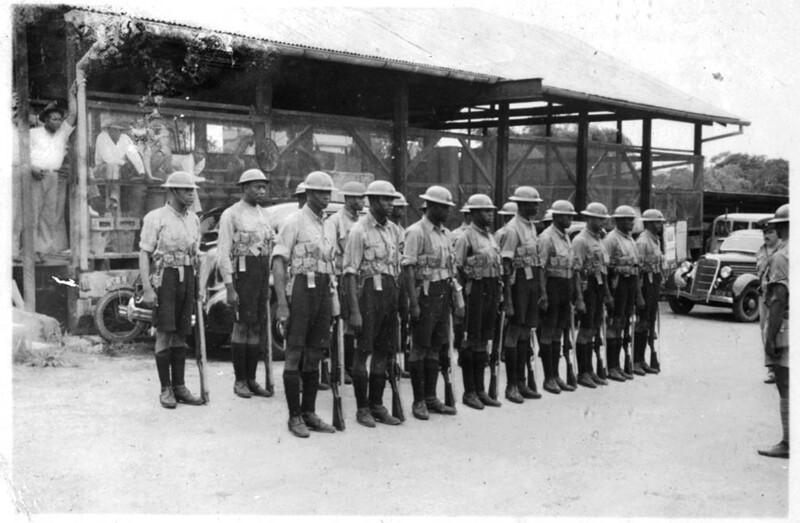 The Port-of-Spain Gazette of October 1898 reported that “That the new military program is beginning to take shape. A new body of fifty armed police is to be added to the Police Force and to be permanently stationed at St. James’ Barracks under the command of Supt. Sergent Shelston. One of the several sergeants from the Irish Constabulary has already arrived and will replace Sergeant Shelston at the Police Station (Police Headquarters). His name is Dennis Cassidy. It appears that there is to be in future a regular interchange of men between the Police Station and the barracks, which will ensure the efficient training of the whole Force as an armed body whilst providing an ever-ready body for any military emergency.” The Police Hospital on Charlotte Street was opened in 1894. Also in that year the Fire Brigade was made a separate unit of the Force. The idea of forming a permanent body of armed men trained to handle civil disturbances was born out of the police maintaining a close scrutiny of the changing political and evolving social tensions that were unfolding in a society that was becoming increasingly conscious and restive of the limitations of crown colony rule. 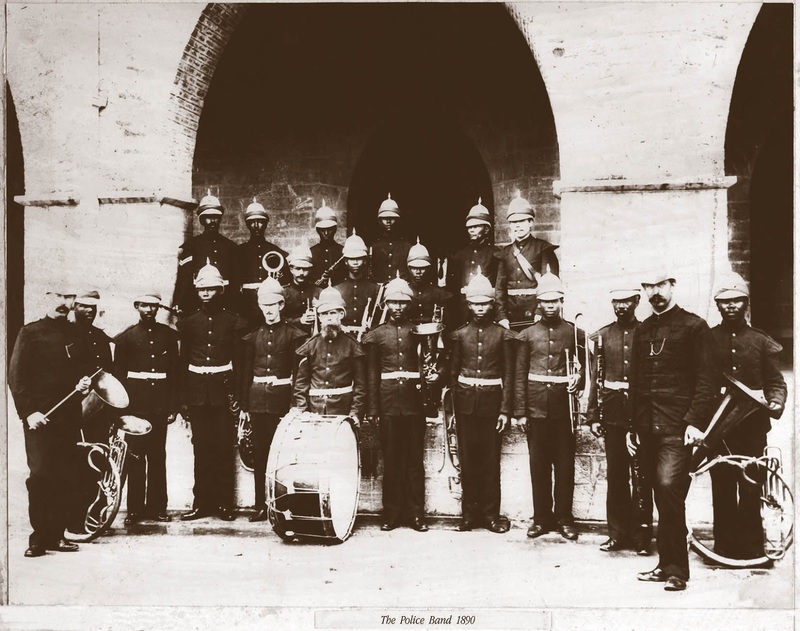 This body of policemen, the first Riot Squad, was brought into action on the 23rd of March 1903 for an incident known as the Water Riot, when, as historian Angelo Bissessarsingh informs us, “Governor Maloney, perhaps expecting public unrest, ordered the Inspector-General of the Trinidad and Tobago Constabulary, Colonel Hubert Brake, to have 35 armed policemen sequestered within the Red House in addition to several dozen outside. In an attempt to limit access to the Public Gallery it was proclaimed that access would only be granted by a system of allotted tickets. 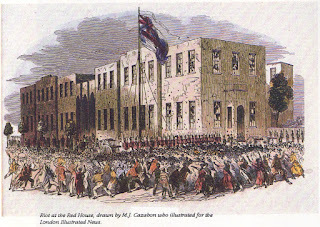 The Ratepayers resisted and deemed this action to be illegal and attempted to storm the Gallery at 10.30 am but were repelled by Brake and his officers.” The ensuing riot caused the Government Buildings, the Red House, where the Legislative Council was in session to catch on fire triggering the reading of the riot act resulting in the Constabulary opening fire on the crowd resulting in eighteen people being shot and killed and fifty-one wounded. Local Commissioned officers wore the six-pointed star which had been identified with Picton's patron saint, St. David of Wales. 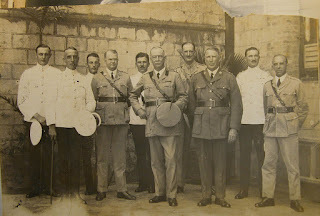 Foreign Commissioned officers, at right, wore their Regiment badges. Sergeant-Superintendents wore a crown on each sleeve. Cap badge bore a crown and the monogram G.R.I., George King & Emperor. Station Sergeants wore four stripes on the lower sleeve. Cap badge bore a crown and the monogram G.R.I., George, King & Emperor. Before 1938 a crown & three stripes formed the cap badge for Sergeants. A crown with two stripes for Corporals, the regimental number for Constables and Lance-Corporals, with a crown. The Mounted Branch would demonstrate their skill at horsemanship with gymkhanas at St. James Barracks on occasion. The Police band in the 1890s. 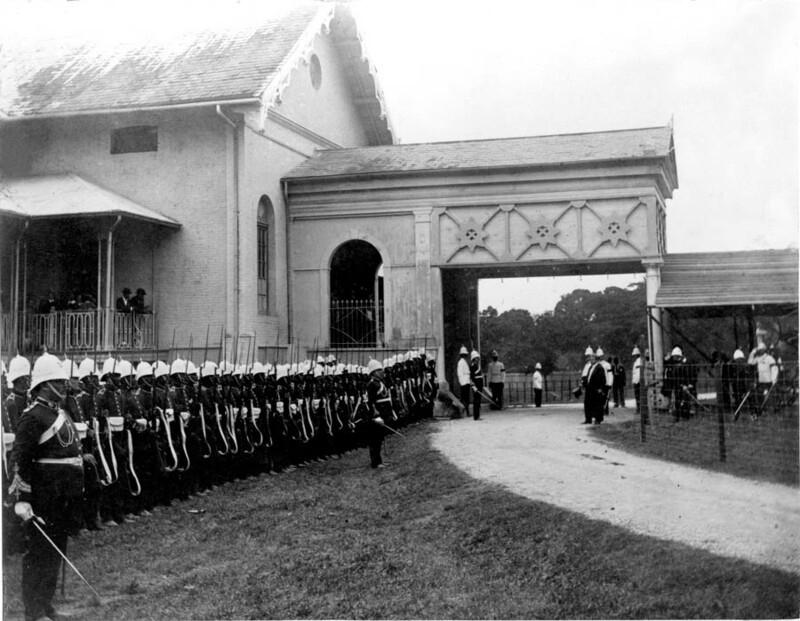 The guard house at the entrance to Government House. The winners of the police annual marksmanship competition. The St. Joseph police station. 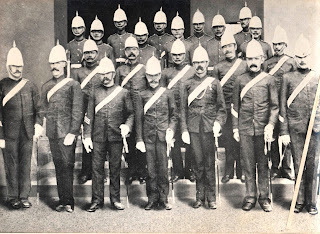 Elements of the 3rd West India Regiment, the Zouaves, stationed at St. James Barracks during the riots of the late 19th century. 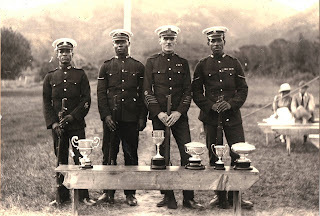 The foundation for discipline, the maintenance of high morale, an esprit de corps, and a military tradition that persisted for a great many years in Trinidad and Tobago’s police establishment, had its origins in the 1900s. was inaugurated on 28th June 1924. Stations throughout the country discipline and order was maintained at a level that could be compared to anywhere in the British Empire, as is shown in the record of regular inspections. 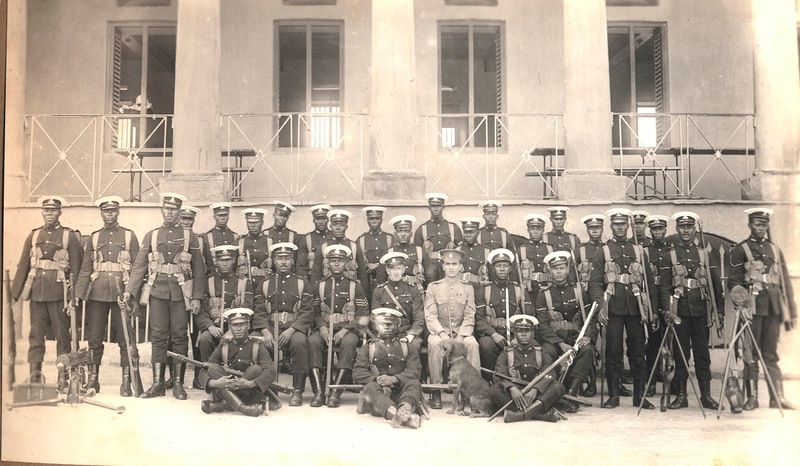 There were, in the ranks in the 1900s, men who had served in India with the British army and with the West India Regiments. 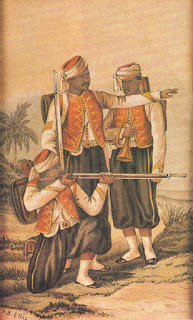 The West India Regiments were raised in the West Indies during the French Revolution as Ranger Companies and also in Sierra Leone on the west coast of Africa. 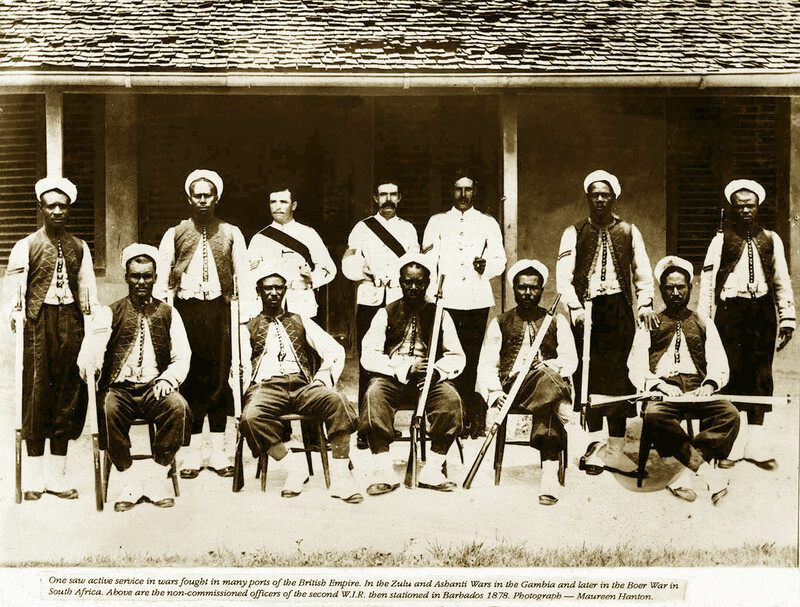 They had seen active service in the wars in the Gambia and in the Anglo-Ashanti Wars of the 1880s. Individuals had been recognised for their gallantry, receiving Britain’s highest awards. 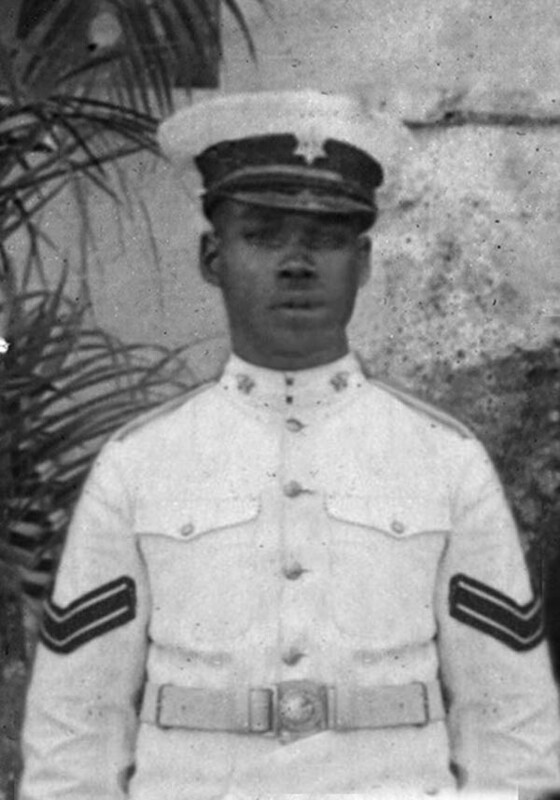 For example, Sergent Samuel Hodge V.C., of the 3rd West India Regiment, was a recipient of the Victoria Cross, the highest and most prestigious award for gallantry in the face of the enemy that can be awarded to British and Commonwealth soldiers. for the honoured dead. Lest We Forget. 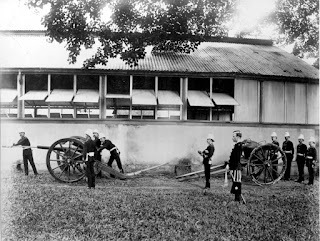 the West India Regiments. Inspector Brierley, writing at the turn of the century, speaks in his book ‘Trinidad, Then and Now’, of his pride in the “unstilted loyalty and strict devotion to duty.” He also points out that in a total company of five hundred rank and file, four hundred were natives of Barbados, St. Vincent and Grenada. It would appear that Trinidadians still had an aversion to join the Force, but, as we will discover, not Tobagonians. 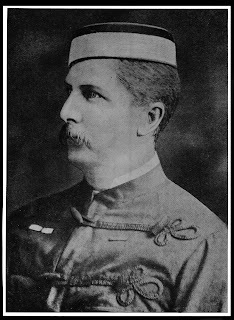 Colonel Herbert Brake assumed command in 1902, he was succeeded by Colonel George Swain in 1907. The military tradition was further enhanced with the start of the first Boer War in South Africa in 1880. This saw men from the Trinidad Constabulary volunteer for service with British regiments. Streets in Woodbrook were named by the colonial government for the British generals of the African wars who had commanded these men; Roberts, Buller, Gatacre, Kelly-Kenny, Baden-Powell, Kitchener and others. Very much the same spirit was to prevail with the advent of the First World War that according to Carlton Ottley, “no fewer than three officers, ten non-commissioned officers and twenty-one men joined the West India Regiment.” Policemen, trained at St. James Barracks, would perform their duty with loyalty and gallantry on the battle-field, with some upon returning home rejoining the Force. They strengthened the military traditions of discipline, loyalty and duty. This also served to entrench an enduring family tradition within the Force that would pass from father to son. General until 1930. At the time of his appointment, the strength of the Force stood at eight hundred and ninety-six, of which no fewer than seven hundred and fourteen were natives of Trinidad and Tobago. 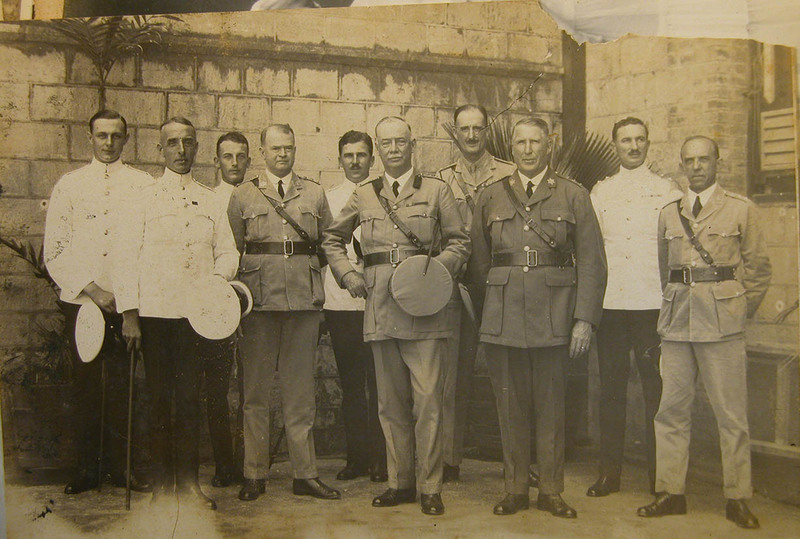 Colonel George May, center, with officers of the First Division. 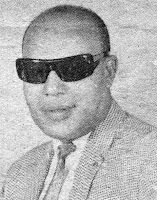 Commissioner of Police “Sonny” Carr. 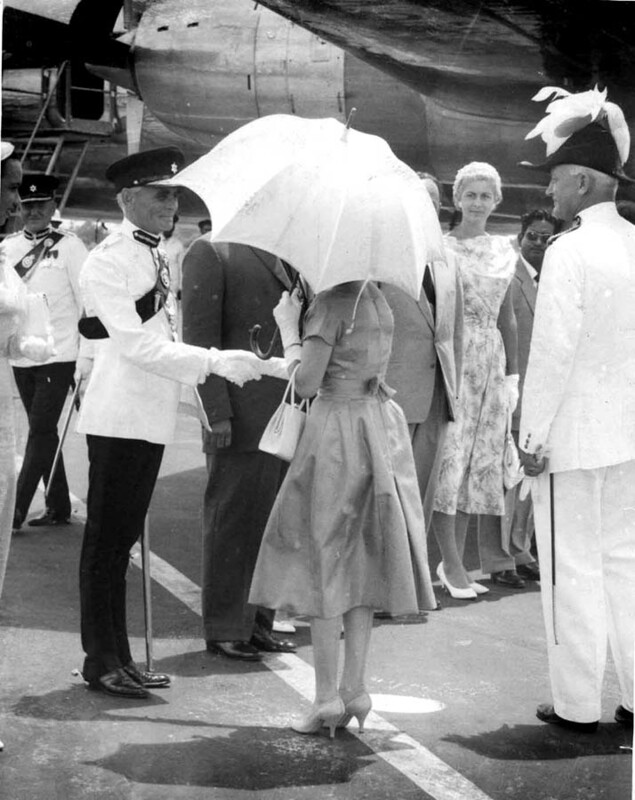 the social life of Port-of-Spain. 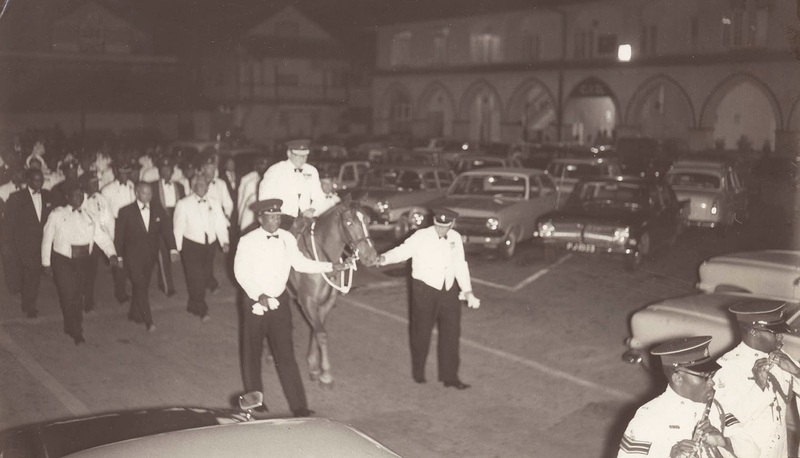 There were now six police divisions throughout the country, including Tobago, each with several stations that were at all times fully manned. These stations were equipped with stables, barracks to house the men and with accommodations for officers. The starting salary in the Force was $24.00 a month. This was regarded as very good, at the time when store clerks made $5.00 or less, per fortnight. 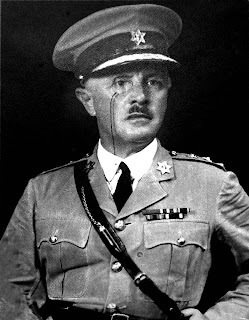 Commandant of Local Forces 1931–1938. Colonel Arthur Stephen Mavrogordato, prior to his posting to Trinidad, was Inspector-General of the Palestinian Police Force. 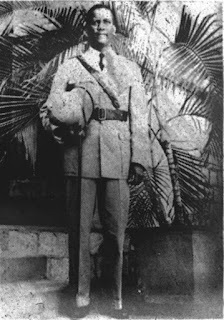 He assumed command of the Trinidad Police Force with the rank of Inspector-General of Constabulary and Commandant of Local Forces in 1931. 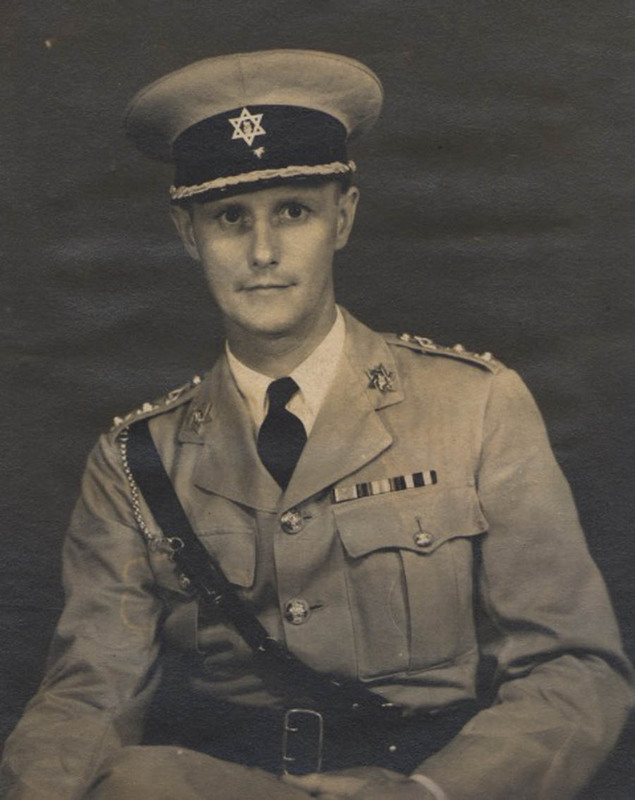 His appointment to Trinidad, having served in the highly volatile Middle East command, coincided with developments in a secret experimental laboratory at Trinidad Leaseholds Ltd. where 100 high octane aviation fuel was being developed for use in the R.A.F. His job here was to ensure that it was not sabotaged. 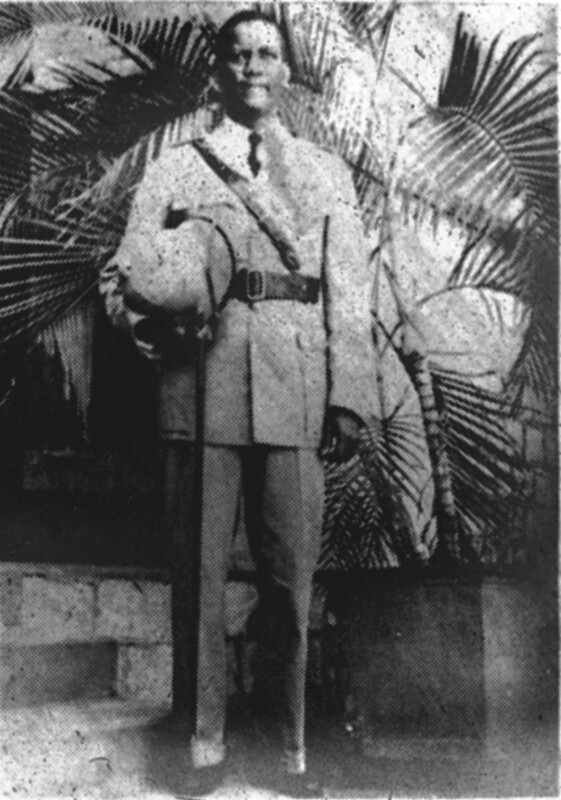 Sub-Inspector Harragin joined the Police Constabulary on 1st February, 1905. 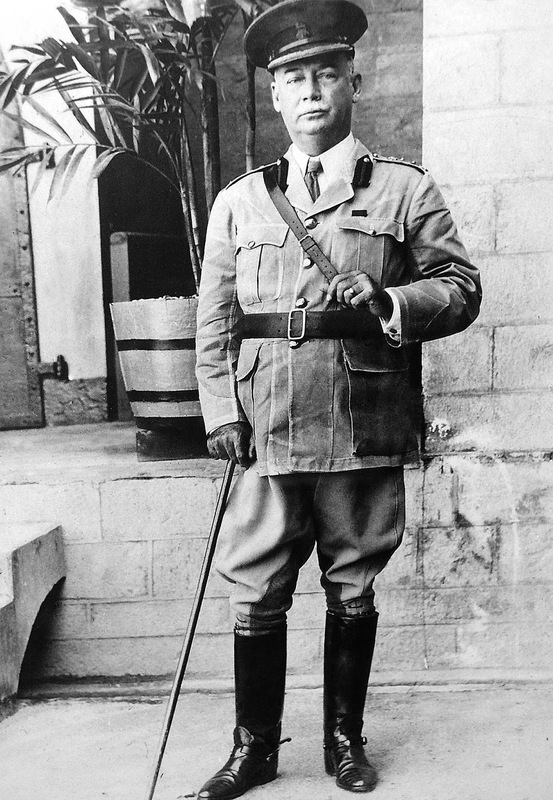 He left the colony in 1915, with the first battalion of the B.W.I. 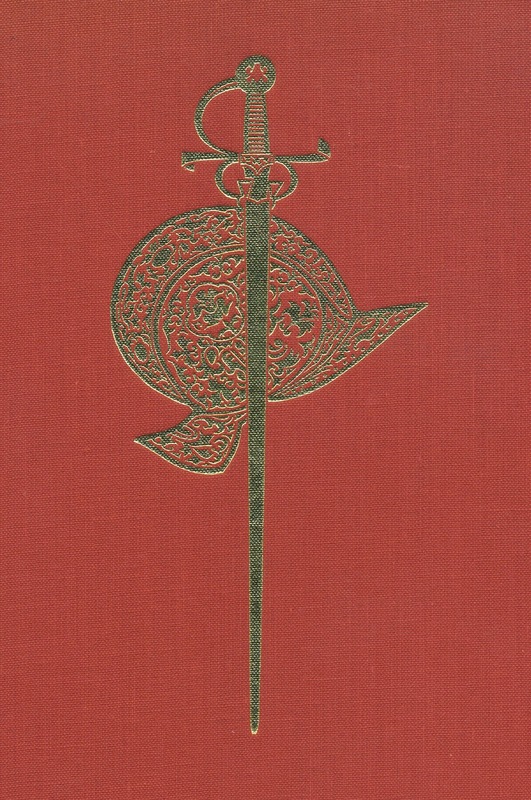 Regiment to serve in the Great War, in which he and his battalion distinguished themselves against the Turks in the charge on the Damieh Bridgehead in the Jordan Valley, Palestine. Harragin was awarded the D.S.O. as a direct result. Also seeing action with the first battalion of the B.W.I. Regiment in the Jordan valley that day was Lance-Corporal Julien, also a Policeman. He received the D.C.M. for valourious service. 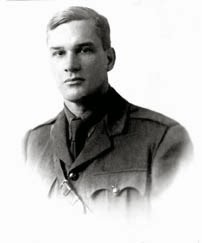 The D.S.O & D.C.M are the second highest awards for gallantry in action after the Victoria Cross. 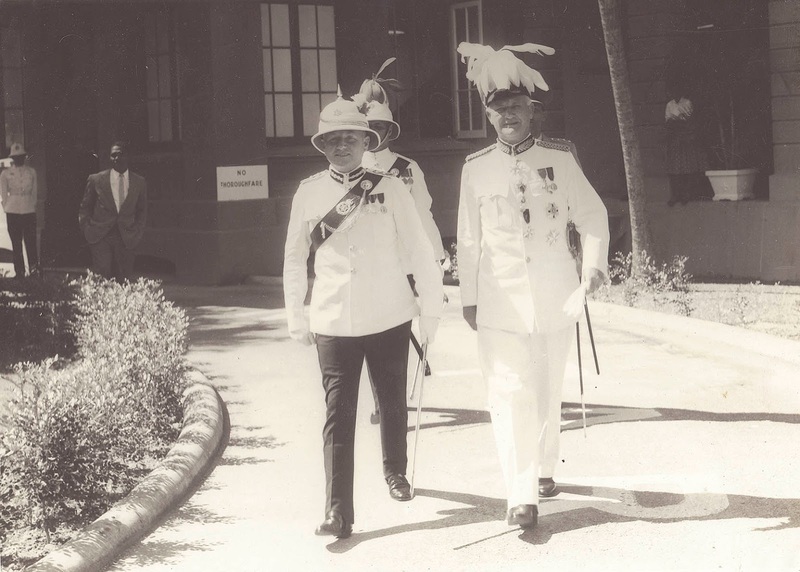 On their return to Trinidad, Lieutenant Colonel Harragin and Sergeant Julien took up their regular duties in the Trinidad & Tobago Police Force. The strength of the Force in 1934 stood at about two thousand men. 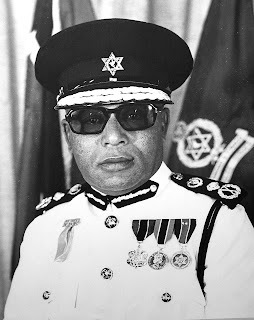 Contrary to popular belief, Colonel Mavrogordato did not ‘give’ the police star to the Trinidad & Tobago Police Force because he had served in Palestine, he was not Jewish and the state of Israel had not yet come into existence. The years between the World Wars, the 1920s-30s, was a time of very great poverty in Trinidad and Tobago. The failure of the world’s monetary order, known as the Great Depression, as well as the aftermath of the war had caused the markets for the island’s agricultural produce, mainly sugar and cocoa, to collapse. There was not just poverty on a very wide scale, along with the deprivations caused by the inequalities of colonial life, but many people faced actual starvation. One of the important, perhaps the most important after-effect of the First World War was the change in the colony’s society. 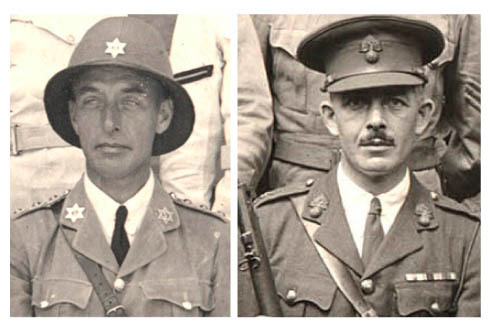 Men who, in their hundreds, had gone abroad to serve ‘King and Country’ returned to these islands greatly changed. The myth of the superiority of the white race had ended on the battlefields of Europe, the Middle East and East Africa where the West India Regiments had served. Trinidadians had seen white men, for the first time, in roles that were not managerial, that did not convey superiority, who, in the terror of the trenches demonstrated the same fear, the same cowardice, or for that matter, the same gallantry, that they themselves possessed. War is the great equaliser. Beyond that, men heard for the first time the call for organised labour and the subtle arguments that sought to describe what would be called a ‘just’ society. 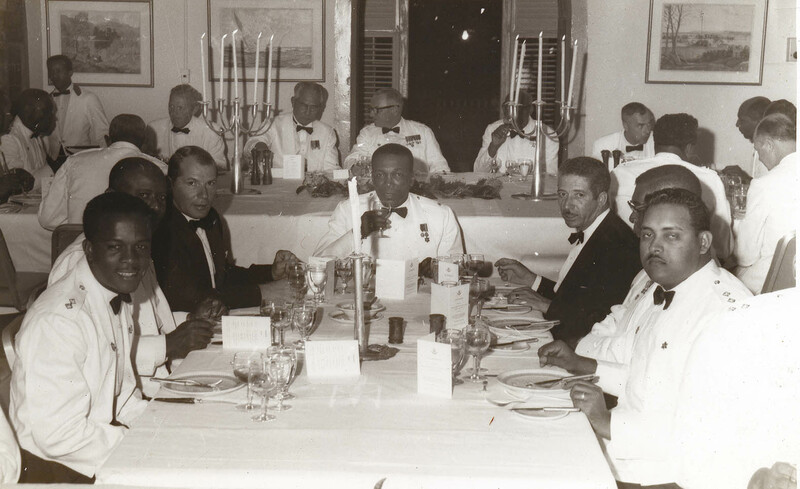 The Russian revolution and the rise of bolshevism, communism, socialist politics and trade unionism had entered Trinidad and Tobago’s political discourse with the returning troops, where it would find fertile soil prepared with the already established Trinidad Workingman’s Association. 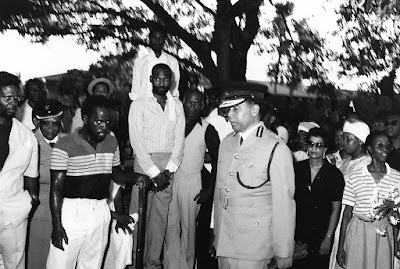 There was as well a growing nationalistic impulse founded in the established resistance to Crown Colony rule that formed itself around ideas of black consciousness. An awareness of ones self as a whole person, increasingly expressed with ideas couched in a political philosophy known as Garveyism, named for the Jamaican thinker, Marcus Garvey. 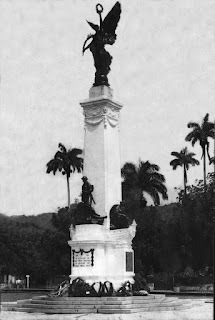 Militant trade unionism in Trinidad and Tobago was to grow and take root in all of the above and express itself in the canefields and in the oilbelt of Trinidad. under the command of Inspector Ogier. Power took the warrant from Price, gave it to Belfon and said; ‘You read it.’ Belfon read it and Power then told him to arrest Butler. information concerning Corporal King. He mustered eighty policemen and left with a bus and two cars for Fyzabad junction. where the remains of Major Wilfred Power are also interred. Sub-Inspector Bradburn later died of gunshot wounds. Carl, alias ‘Charles or Charlie’ King. 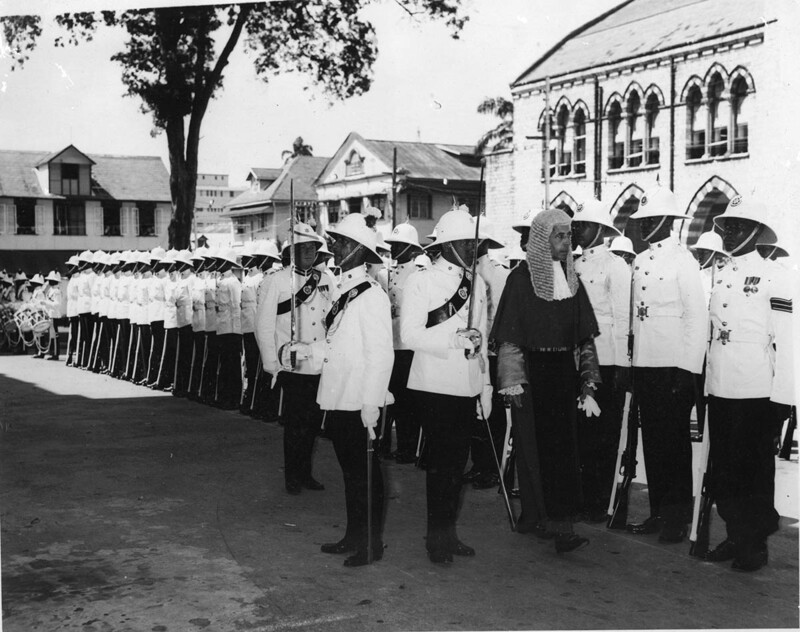 St. Ann’s, in 1936 (note black armbands in mourning for King George V). 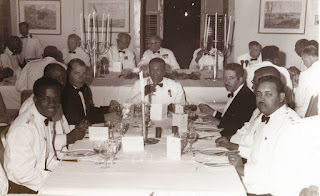 Colonel A.S. Mavrogordato is seated third from the left. In 1938 the nomenclature of the Force was changed from the Trinidad and Tobago Constabulary to the Trinidad and Tobago Police Force in the new Ordinance No. 5 of 1938, under which the Inspector General of Constabulary became the Commissioner of Police. New posts of Superintendent and Assistant Superintendent were created. The title Superintendent Sergeant, the ‘Super Sergeant’, gave way to Station Sergeant. 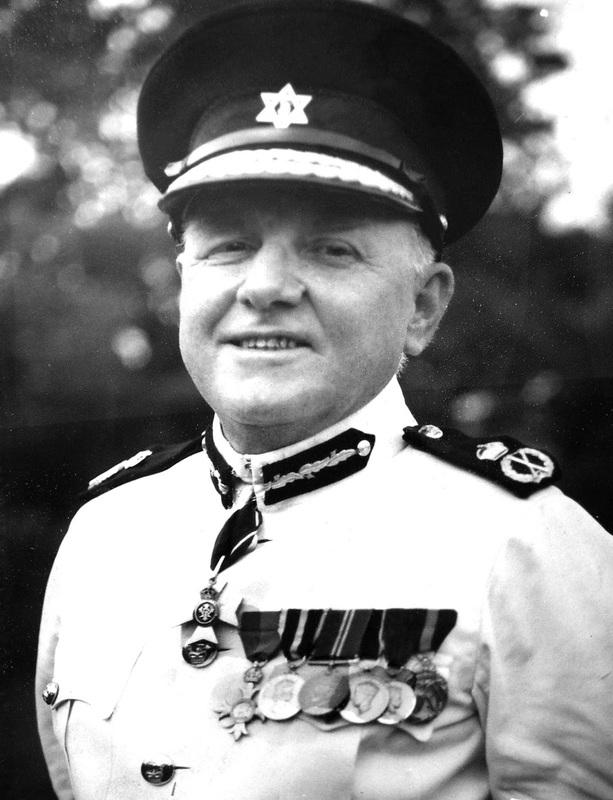 Also in that year, Colonel Walter Angus Muller became the first Commissioner of Police. 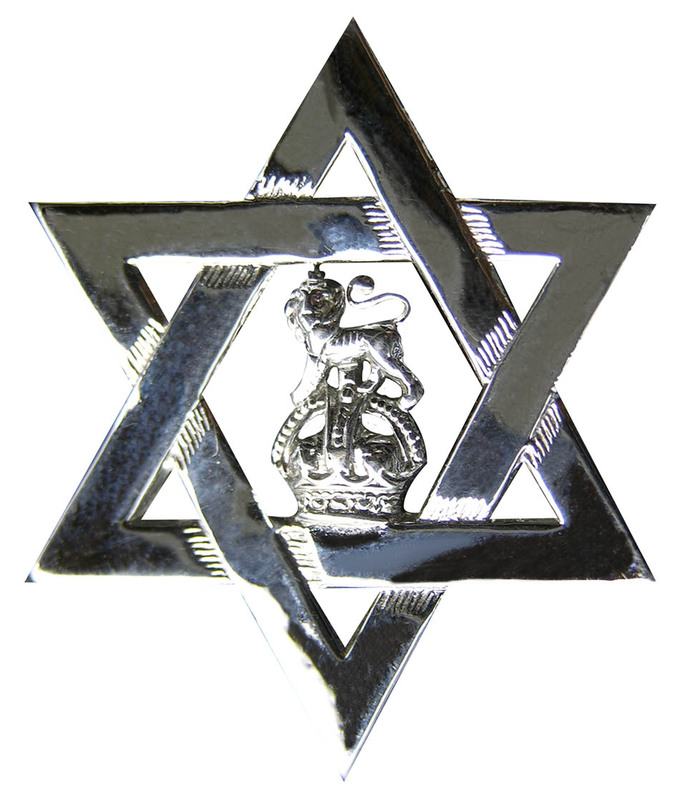 It was during his tenure that the emblem of the Force, the six pointed star, which was previously worn only by local gazetted officers, in remembrance of Colonel Picton’s patron saint, St. David of Wales, was allowed to all ranks as a cap badge. 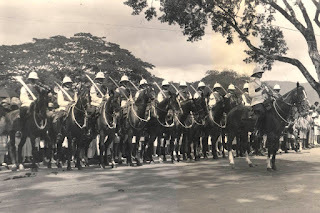 The Mounted Branch on parade with drawn sabres. 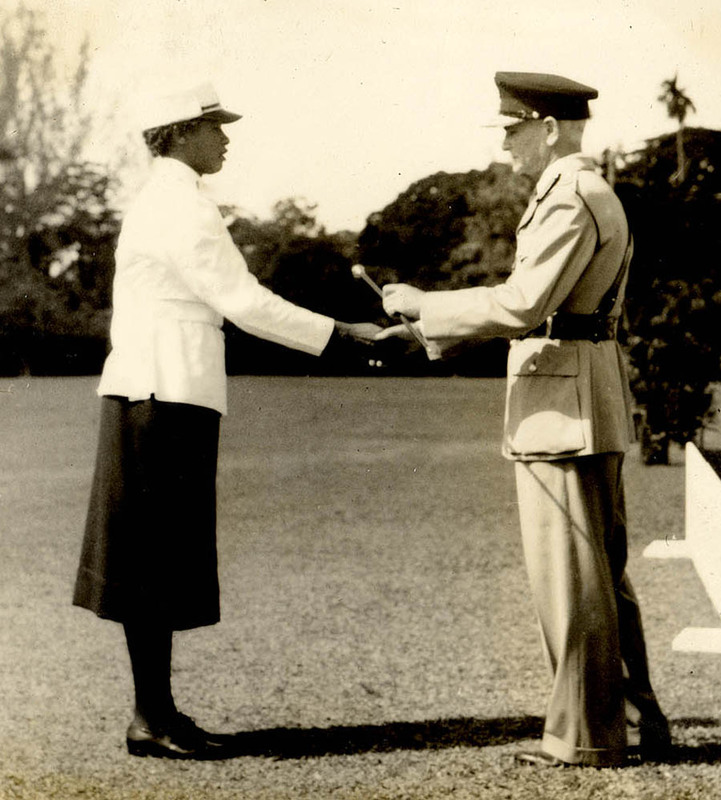 1943 witnessed the elevation of Arthur Johnson to the post of Assistant Superintendent. 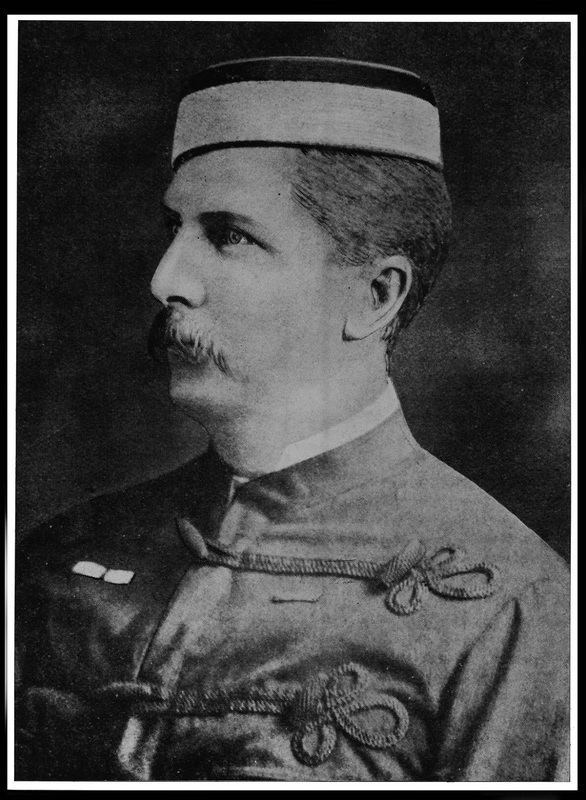 He became the first gazetted officer to be promoted from the ranks. He was also the first man of colour to achieve such a rank in the Police Force. His appointment was the first of several that would gradually alter the nature of the composition of the officer corps of the Force. 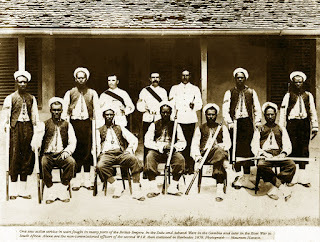 It is of interest to note that in the Trinidad Militia and later in the Trinidad Volunteers, persons of colour had held commissioned rank from the early 19th century. have come to hand on the quantity of enlistments. This period was one of heightened readiness for the Force as there was an ever present threat of alien infiltration and sabotage. The oil refineries were particularly vulnerable because of the secret development of 100 high octane aviation fuel underway at Trinidad Leaseholds Ltd. There was as well, as Ottley reports, “the arrival of thousands of immigrants from the other West Indian islands. Their coming posed a great strain on the social services and on the enforcement of law and order.” Other difficulties, many new and complex, were generated by the American military and naval forces stationed in considerable quantities at various points of the island. This tended to generate tensions that had to be handled with discretion, as there were confrontations between police and servicemen. for the first time for all ranks. represented in the Censorship Unit run by first Mr J. K. Thompson and later by Captain Daniel, with their carefully chosen 700 censors. As soon as the war in the Caribbean escalated in 1942, the secret war in the island became intense, with constant hunts for spies and double agents, many of whom were caught and shipped off to Canada for further interrogation. 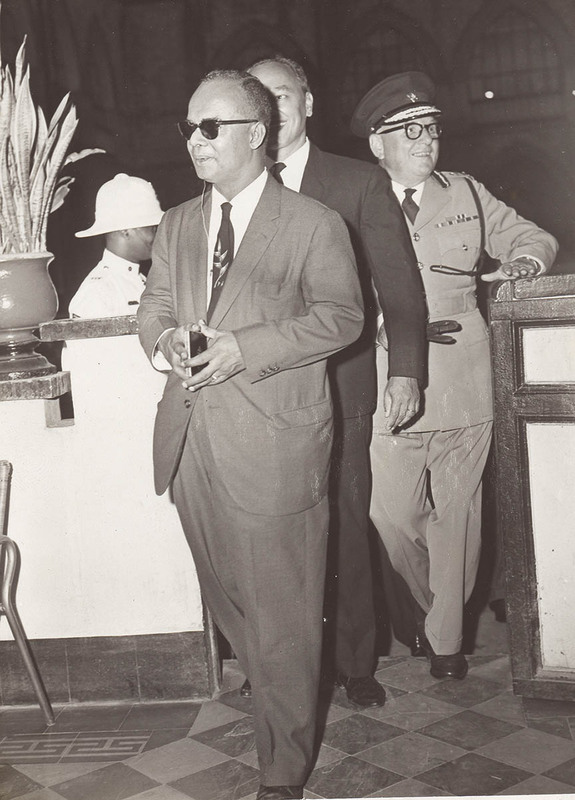 Trinidad was declared the international inspection port for all air and sea travel to and from South America, and Special Branch carried out searches, inspections and counter intelligence operations. On occasion, they were required to use selected applications of deadly force in this dangerous clandestine world of counter intelligence. They were assisted in some of their operations by specially selected and trained members of both the Customs Division and the Boy Scouts. Most of what the Special Branch accomplished in their numerous undercover operations must remain secret, but under the direction of MI 5 and MI 6, they played a major role in keeping South America either neutral or in the Allied camp, despite the wishes of the German-speaking South Americans and the aspirations of some of the Dictators on the continent. At the same time, they helped to cut down on the losses in the Battle of the Atlantic. “At the start of the Second World War, the Local Forces consisted of one regular and one part-time battalion of infantry. This was inadequate to handle the defense of the island and secure the oilbelt and refineries, as well as handle marine patrol. Thus the Police Force was required as a mobile light infantry reserve, although they had ceased infantry training some time before. 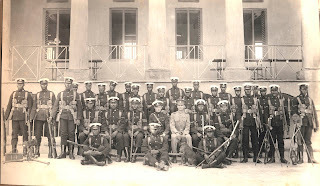 A detachment of police as a mobile light infantry platoon. 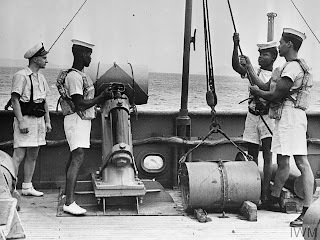 Initially before the Trinidad Royal Navy Volunteer Reserve built up its strength, policemen were required to do harbour patrols off Port-of-Spain, Point-a-Pierre, San Fernando and Point Fortin. In this they were assisted by Rover Sea Scouts. They also were required to be part of the Civil Defense Force, and indeed, the Commander of the Police Force was the island’s Civil Defense commander. In this role they acted as Air Raid Wardens and for whatever other duties were required from time to time. 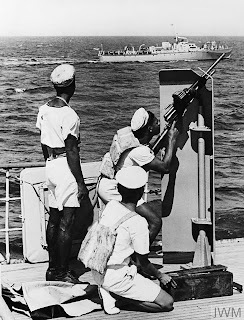 Under the threat of a dramatic German naval presence in the Atlantic Ocean, for example the German battleship “Graf Spee” with its accompanying flotilla breaking out into the shipping lanes in 1939, virtually the whole Force was withdrawn from all other duties and deployed to the south coast alongside the soldiers. Their job in the cities and towns was taken over by the Special Reserve constables, the rural constables and precepted Boy Scouts. This established a working relationship that existed for the rest of the war, because when the Graf Spee crisis was over they found that the reserves had done a creditable job. 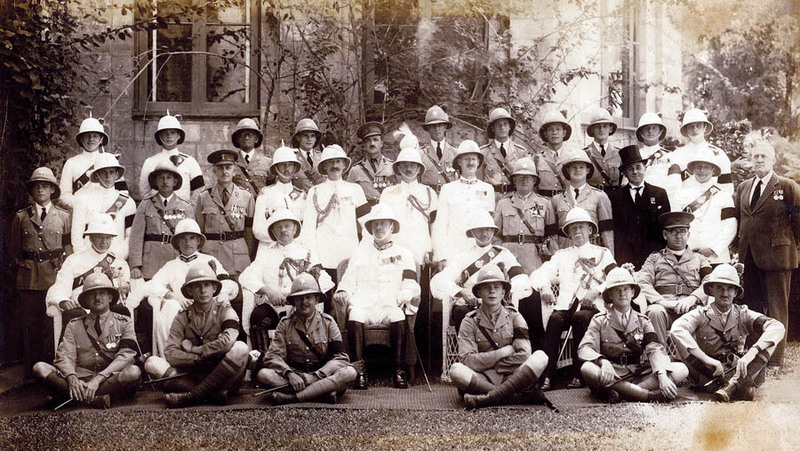 A Boy Scout troop from Queen’s Royal College. The immediate post-war period, 1945, saw strike action taken on the waterfront, and in 1946 strikes and arson recurred in the oilbelt. This was also a time when sensational murder trials became all the news and people became familiar with the names Boysie Singh, Bumper, and Thelma Haynes. 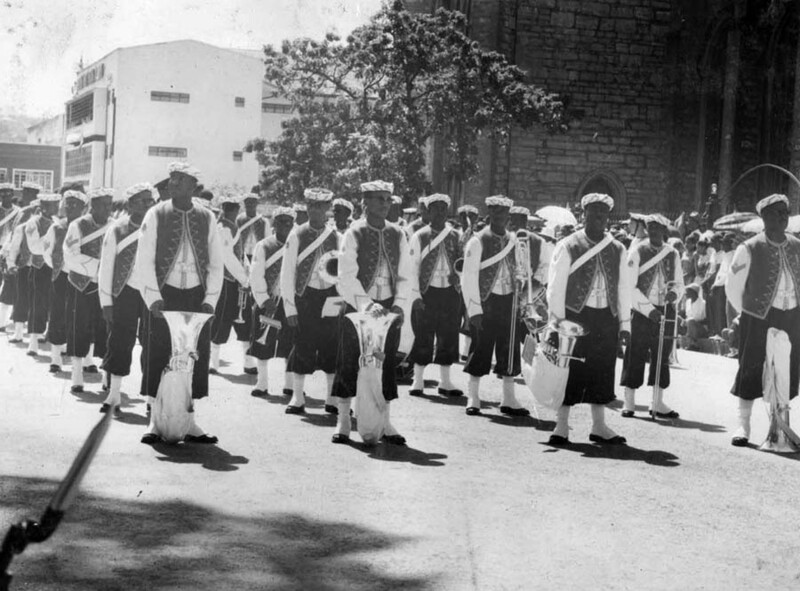 The first serious steelband riots began in 1947, with Casablanca fighting All Stars, Invaders and Rising Sun. In the years between 1947 and 1951 there were numerous clashes between bands like Invaders and Tokyo, Tokyo and Casablanca. Many steelbandsmen were given long prison sentences for crimes of wounding and rioting. 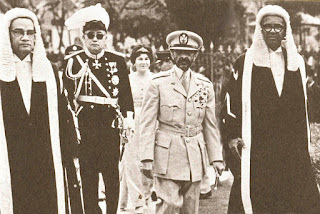 These clashes continued until the main band, Casablanca, which was the band that fought everyone except Desperadoes, along with All Stars, Invaders, Tokyo, Rising Sun, and Desperadoes were invited to a “Peace Settlement” at St. Paul Street Quarry in 1951. 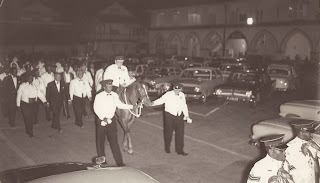 Clashes were to continue, the most spectacular taking place in the carnival of 1965 between Fascinators and Highlanders on Charlotte Street, directly in front of the General Hospital. 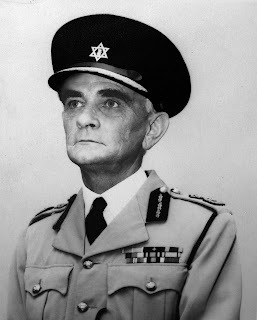 Colonel Eric Beadon relieved Walter Muller as Commissioner of Police in 1949. He would be the last foreign-born head of the Force. Former Commissioner Eustace Bernard writes that, “The Trinidad and Tobago Police Force was at that time, according to one of Her Majesty’s Inspectors General of Colonial Police Forces, the best in the Colonial Police Service”. An early innovation under Beadon’s watch was the introduction, in 1950, of the 999 emergency call number. Also in that year the colonial Government, by Ordinance No. 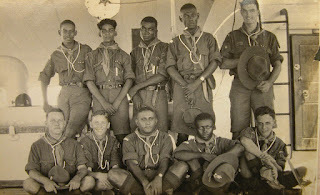 14, created the Trinidad and Tobago Police Service Social and Welfare Association. 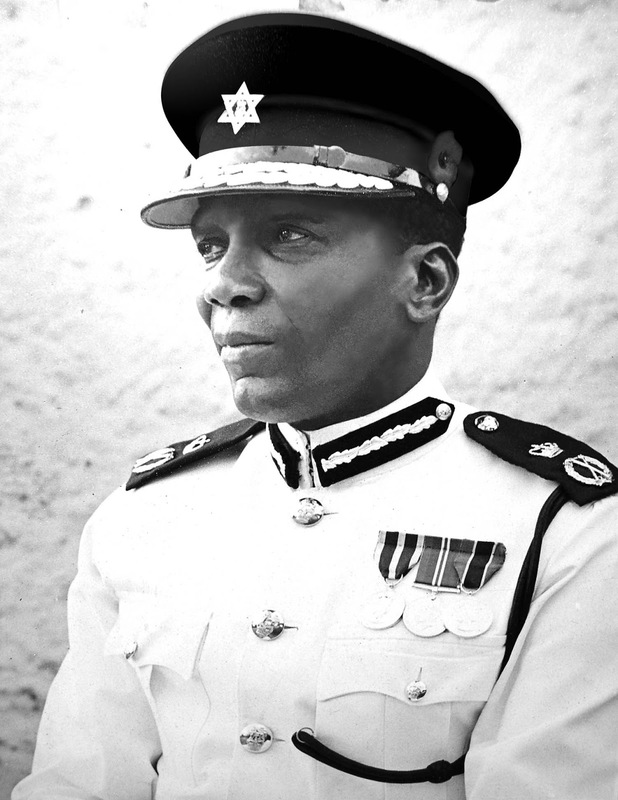 Carlton Ottley writes, “The new institution, dedicated to the welfare of its members, for the first time allowed policemen to have a direct say in the conditions under which they would work. In the future, as a consequence, they would not merely have to do and die. They would be free, as they are today, to decide where both the interest of the country and that of themselves and their families rest. The formation of the Association was in fact a most revolutionary turn in the affairs of the Force, one which over the years has produced inestimable benefits both to police and public.” This was, as we shall see, not the view of the officers who led the Force. In 1951 the Fire Brigade by Ordinance No. 12 of that year established its existence separate from the Police Force. Previously it had been under the command of the Commissioner of Police. presenting ‘Best Stick” to a W.P.C. 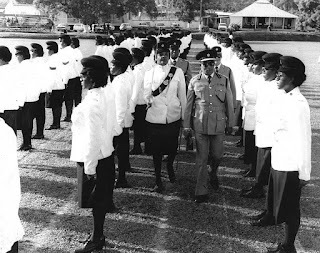 The first Women Police Squad was commissioned in 1955.
illegal immigrants, particularly from the other islands, have become such a scourge that the calypsonians have made many a song about. by the Commissioner of Police, Colonel Eric Beadon. 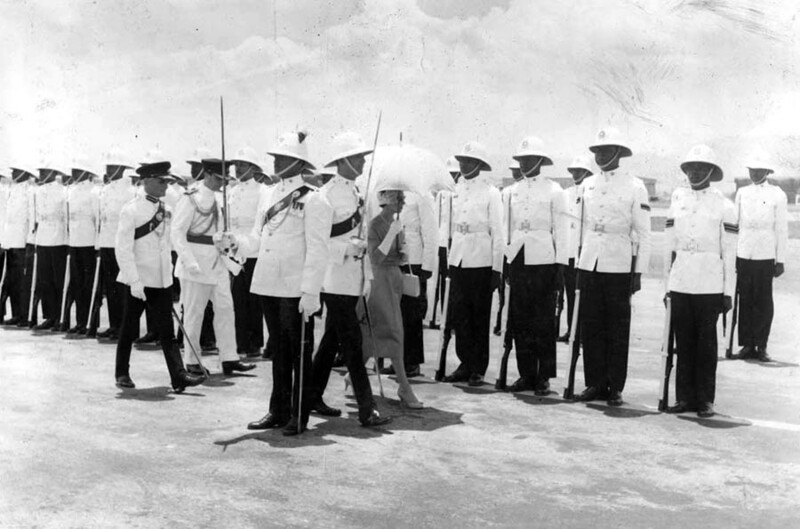 She inspects a guard of honour drawn up by the Police Force and the West India Regiment. The band of the West India Regiment on parade in Port-of-Spain. drawn up outside of the Red House at the Opening of the law term in the mid-1950s. 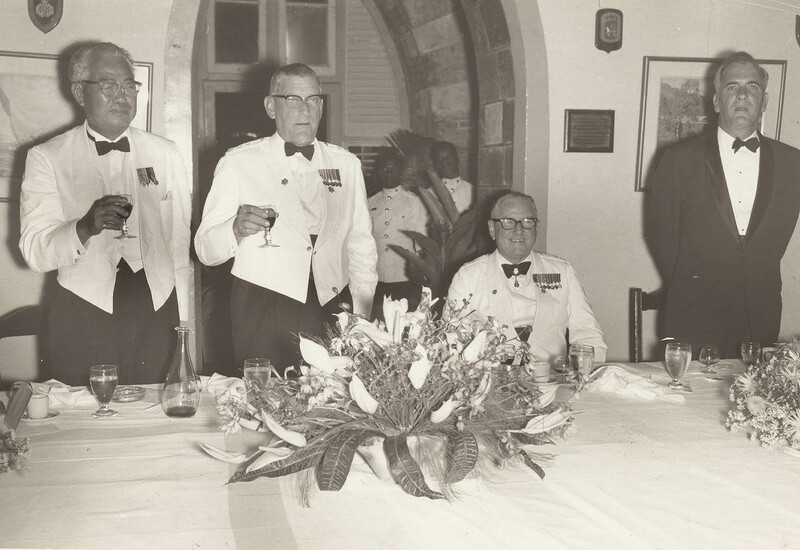 The First Division dining at Police Headquarters in 1968. Assistant Commissioner Eustace Bernard is at the head of his table. The political atmosphere, in the lead-up to Independence, proved to be divisive on many levels. The most obvious differences were racial, as tensions grew not just between the two largest racial segments in the country, that represented the political divide, the Africans and the Indians, but overtly, and for the first time, between the blacks and the whites. 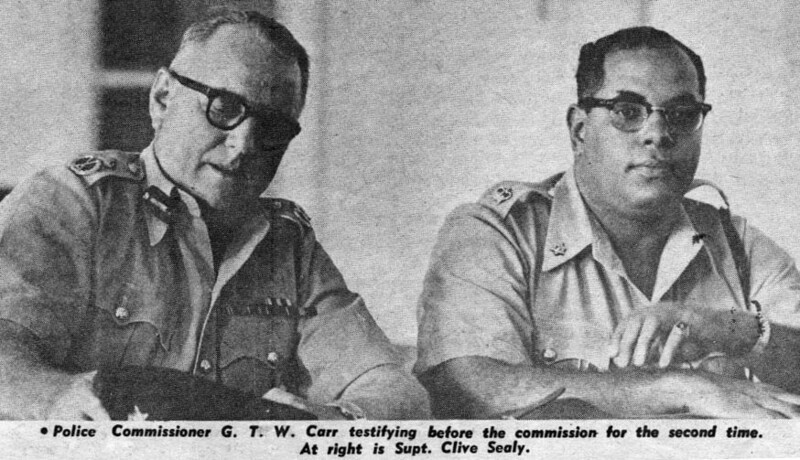 Commissioner of Police, George Carr, left, and Superintendent Clive Sealy, right, testifying before the Commonwealth Commission of Inquiry into the Trinidad and Tobago Police Force. On the question of training recruits, Mr. Justice Darby, the head of the Commission, said he had sent for a syllabus from the Canadian police authorities, and that out of a total of 1,122 hours of training, only 287 hours of drill were used for Canadian policemen. 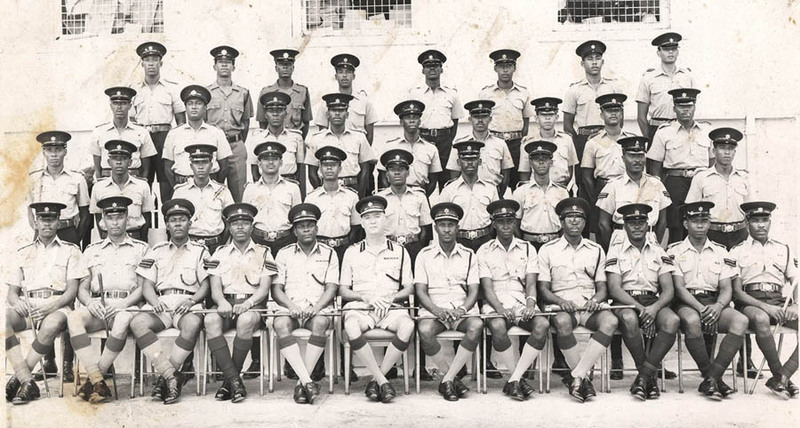 In contrast, the Trinidad recruits underwent 960 hours of training during their six month course and did 470 hours of drill work. Mr. Carr maintained that this amount of drill was necessary because the Force was considered a military unit. Chairman Judge Walter Derby did not agree. There were other divisions of opinion; these concerned the veracity of populist politicians with regard to the prosecution of law and order. It was a matter of trust. The people trusted the Police Force. As a paramilitary force they had served the country faithfully, they were, for all intent and purpose, the army. It would appear that they were expected to give up that role at Independence with the creation of a Defense Force. In 1961 there were public misgivings voiced in the press concerning any changes, with particular regard to placing the Police Force under ministerial (political) control. In the year after that, 1962, the appointment, dismissal and promotion of members of the Force were taken out of the hands of the Commissioner of Police with the setting up of a new Police Service Commission that would take over all responsibility for the recruitment, promotion, discipline and retirement of members of the Police Force. 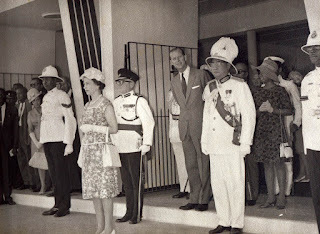 During his time as Commissioner, Trinidad and Tobago was host to the visit of Her Majesty Queen Elizabeth II and his Royal Highness Prince Philip, Duke of Edinburgh. This state visit lasted from February 7th to the 10th. In April of that year the country played host to His Imperial Majesty, Haile Selassie. These state occasions necessitated police work on several levels, from ceremonial parades, to the actual organising of events, to security, to crowd control. Assistant Commissioner Eustace Bernard was in charge of the organising and implementation of these state occasions. and His Excellency, Sir Solomon Hochoy, Governor General of Trinidad and Tobago. Her Majesty enters the Red House to open to open Parliament. She is accompanied by the Speaker of the House and the President of the Senate. A woman police corporal (left) in the new uniform issued for W.P.C.’s in 1965. 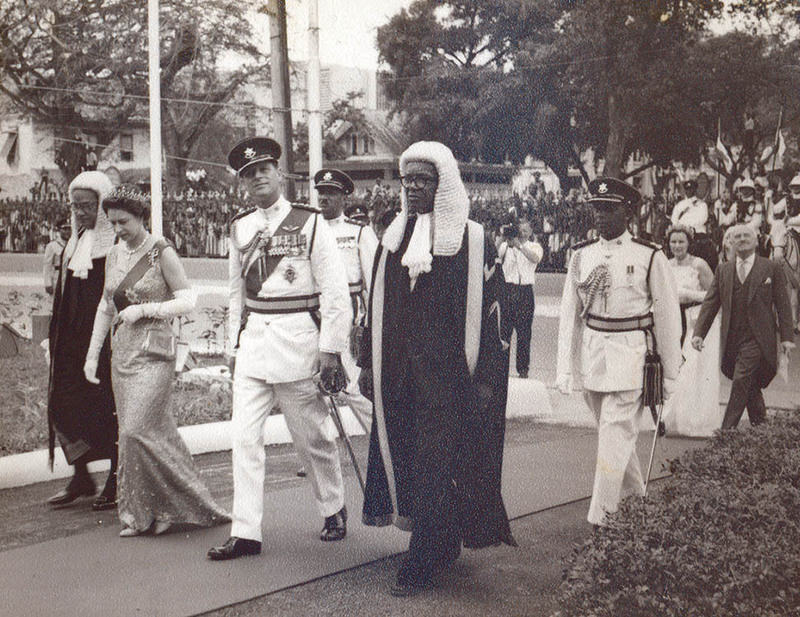 Haile Selassie, Emperor of Ethiopia in 1965.
and the President of the Senate. 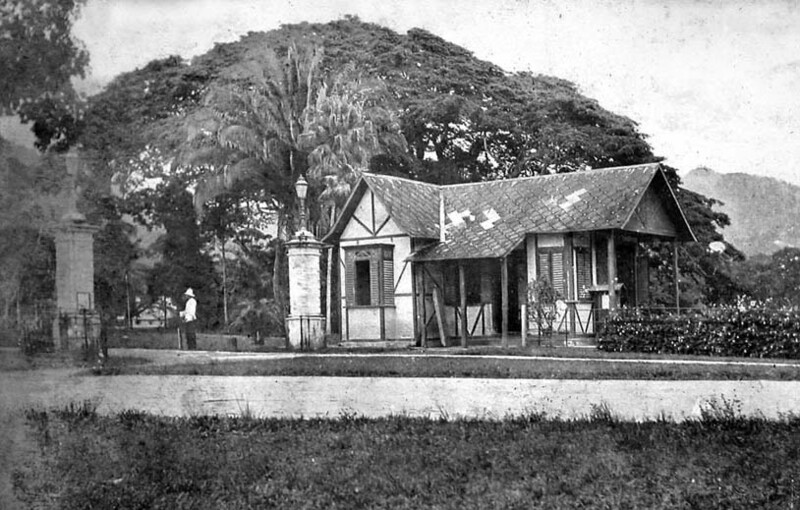 residence at St. James Barracks. and Commissioner of Police ‘Sonny’ Carr. Trinidad and Tobago of British descent. 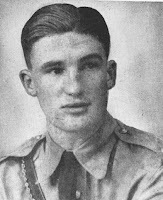 As Kelshall was to remark in his book, ‘A Close Run Thing’, “What everyone (in government) overlooked, either deliberately or simply because no one in the hierarchy realised it, was that from the end of the Second World War to the week before Independence, the Police Force had been the army, and that they had a tradition of being the army for more than a century. It was unrealistic to ask the police to overnight become a civil organisation. 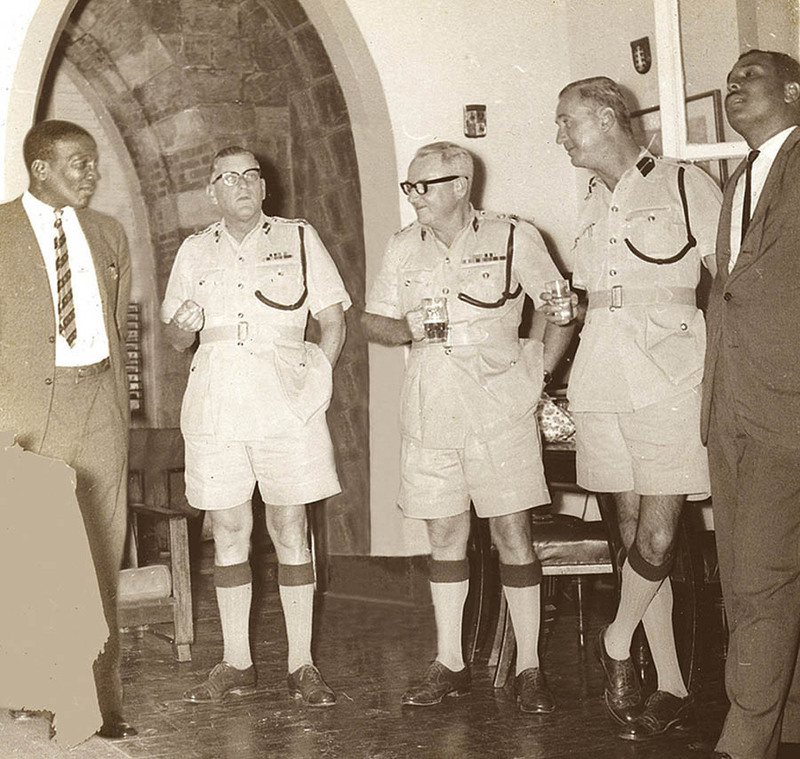 In a token gesture, the name Police Force was changed to Police Service (in 1966) and they were now supposed to be a civil organisation.” In actual fact, the standing orders remained fundamentally in place as were the men who commanded the Police Force. the Honourable Gerard Montano at a Passing Out Parade. behind Gerard Montano is Deputy Commissioner James Reid. 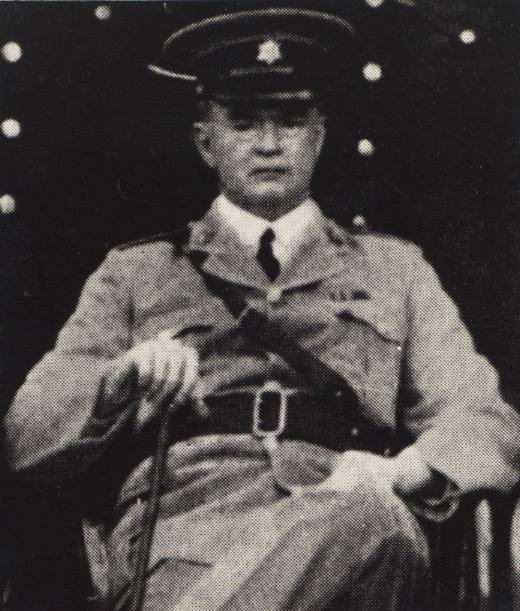 The new Commissioner of Police was George Thomas Witmore “Sonny” Carr. 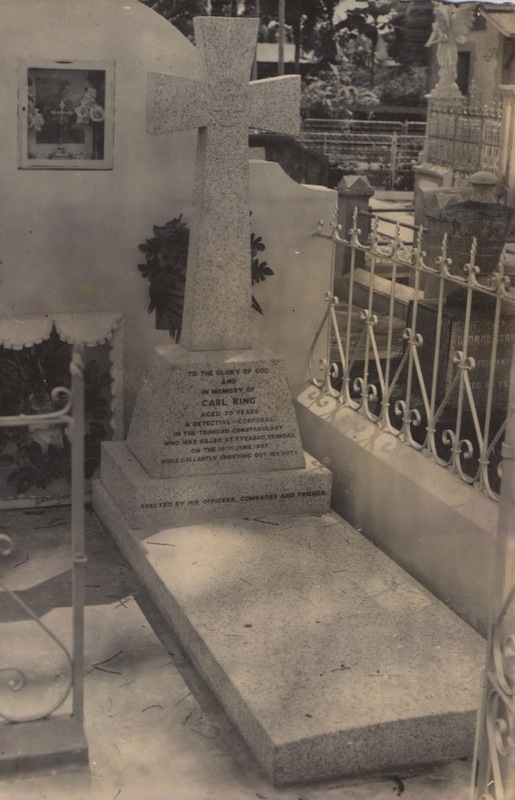 He was a son of a gazetted police officer who had come to Trinidad in the 1900s and had married a local lady. 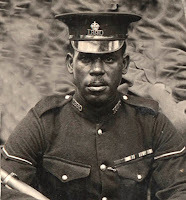 “Sonny” Carr had, in a manner of speaking, grown up at the St. James Barracks and as such was known to the rank and file. The year of our Independence, 1962, also saw Dr. Eric Williams become the first Prime Minister of Trinidad and Tobago. Independence marked the end of an era in the affairs of the Trinidad and Tobago Police Force. 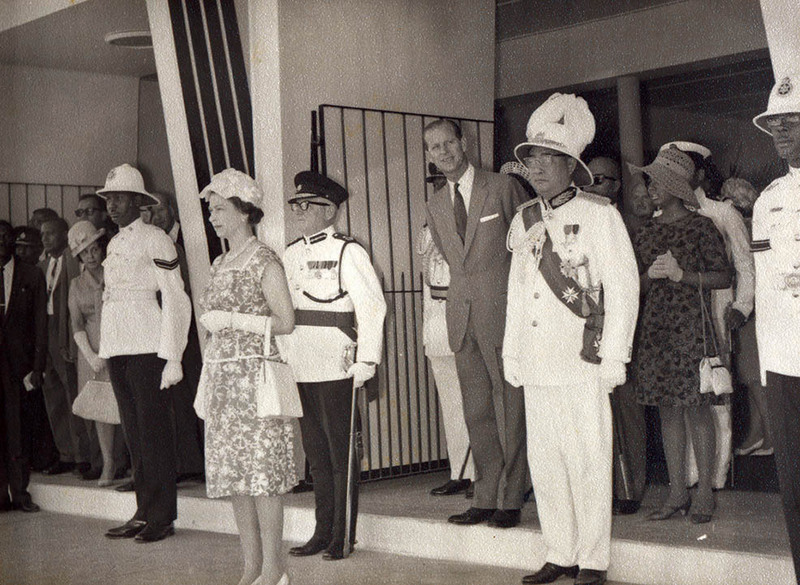 They were no longer responsible to the British Government, but to the people of Trinidad and Tobago. 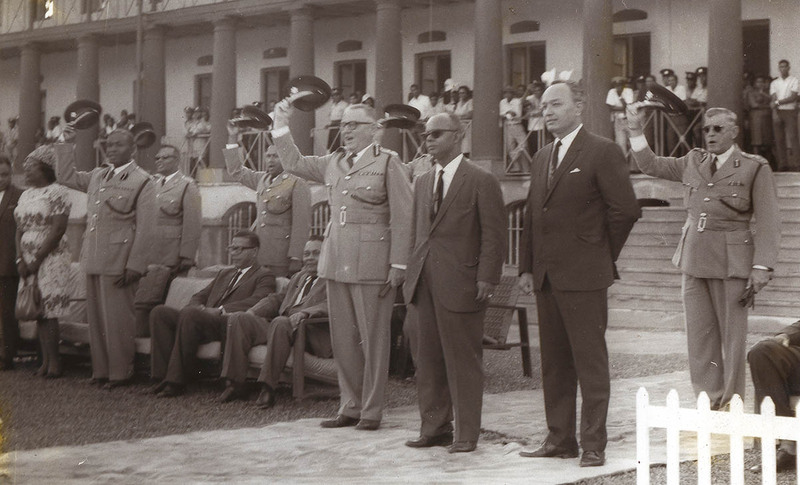 In Kelshall’s opinion, Dr. Williams was “an autocratic leader and as such he must take much responsibility for what took place immediately after Independence.” Kelshall believed that Williams started with a serious disadvantage. “He was a social historian. . . he knew very little of military affairs. . . The fact that he annually laid a wreath at the Cenotaph where there were one hundred and eighty names inscribed never seemed to reach him. 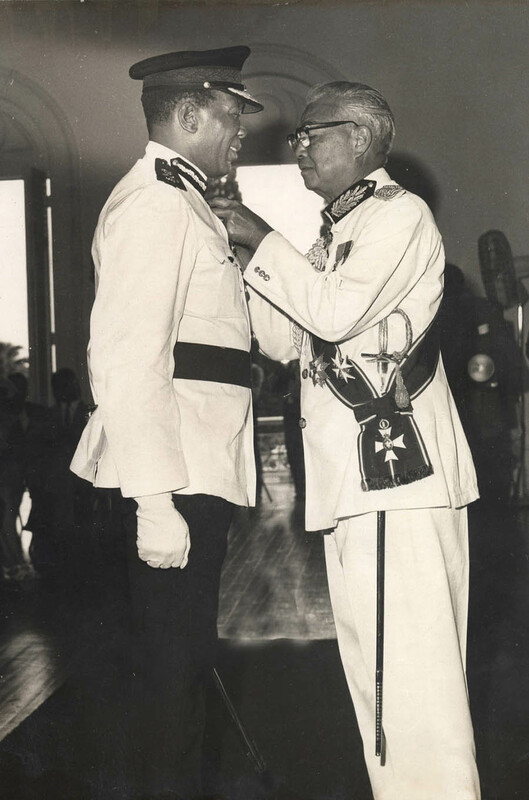 Unfortunately, his influence was so strong that his view of military affairs was widely copied and contributed in no small measure to the lack of a military tradition in Trinidad and Tobago in the post-war years. Commissioner Carr are Mr. Tony May and Mr. James Rodriguez. 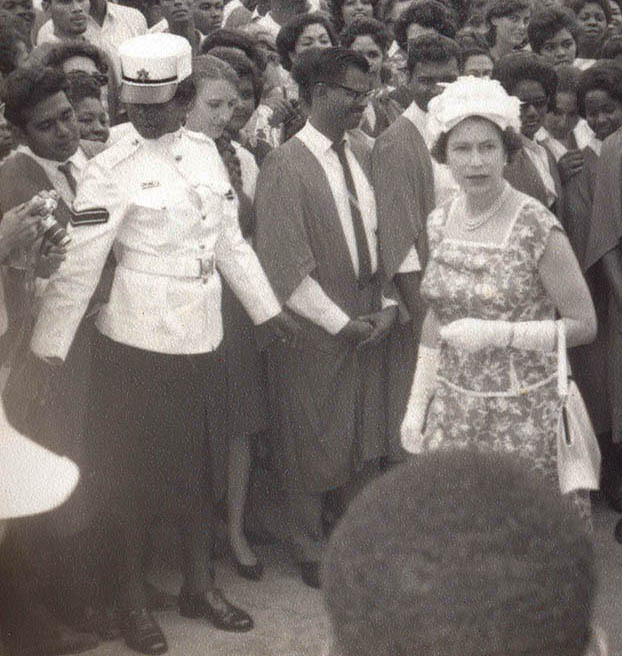 This was a time of fundamental changes affecting not only the institutions of the state but the entire society, as adjustments were made psychologically and materially to the Independence of Trinidad and Tobago from Great Britain. One such change was the nature of the Press and its relationship with the police. 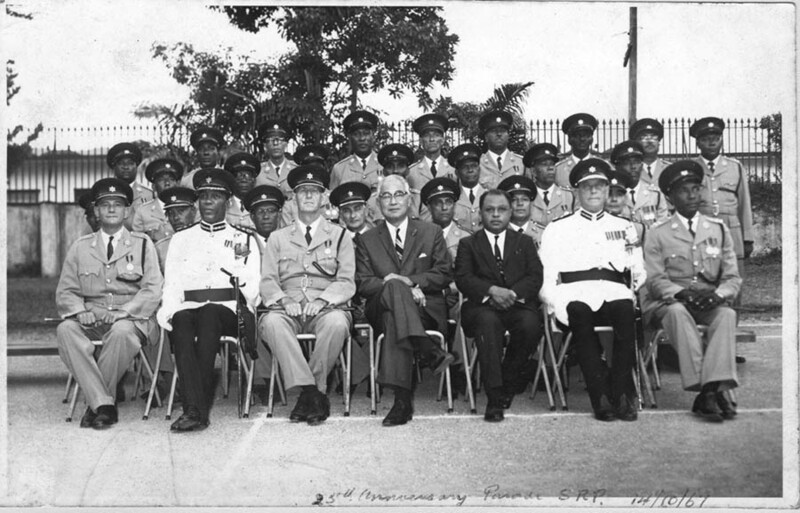 At the 1964 Commonwealth Commission of inquiry into the Trinidad and Tobago Police Force. Commissioner Carr stated “The main reason that our efforts have not been very successful, regrettably is a most important medium for promoting public relations, the Press, is by no means co-operative.” He charged the newsmen with misconstruing, distorting and fabricating news and said it has had adverse effect on the Force. He said that news that would give the Force credit was seldom given prominence. Tony May was appointed Acting Commissioner. commence in June, was still overseas. He goes on to say, “By far the most revolutionary measure undertaken by Government, however, was the introduction of the Police Service Act No. 30 of 1965. Among other changes, the First Division Officers would henceforth come under the general regulations of the Civil Service in regard to certain appointments.” Carr was to serve as Commissioner until 1966, when he would be succeeded by James Porter Reid; he too had been born in Trinidad of an English father and a Trinidadian mother and would serve as Commissioner from 1966 to 1970.
frustrations felt by a generation of young black people, who in the aftermath of Independence, could not foresee how their hopes and ambitions, that had been inspired by the independence movement, could possible be realised. The Black Power uprising took place in the wake of labour unrest and strikes during the1960s and events at a Canadian University and were formulated and expressed in the habitual rhetoric of resistance. This language and behavior had its origins in resistance to slavery and later resistance to colonial rule and worker repression, and was seen by many as unfounded because by all intent and purpose the government of the country was a black one. These demonstrations also took shape against the backdrop of world events, not the least of which was the rise of black awareness and the struggle for freedom from tyranny in the United States, South Africa and in other parts of the world where colonial rule, although in the process of passing away, sill lingered, rooted, as it were, in the vested interest of those who still held power. 1970 was a testing year for the Trinidad and Tobago Police Service, with large Black Power street demonstrations, at times numbering some ten to twenty thousand people, on the streets of Port-of-Spain during the months of February, March and April of that year. 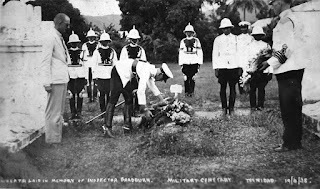 There was as well a mutiny of the Trinidad and Tobago Regiment at their base at Teteron Bay in Chaguaramas. Commissioner James Reid’s term of office was due to come to a close at the end of May of that year. 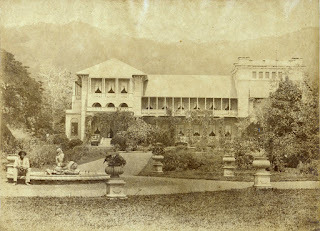 at Carr’s right, Sir Werner Boos, Colonial Secretary. His successor, Deputy Commissioner Eustace Bernard, whose appointment was to be effective from June 4th 1970, was abroad in England sitting his final Bar exams. Bernard, in being appointed Commissioner, had broken the proverbial glass ceiling. 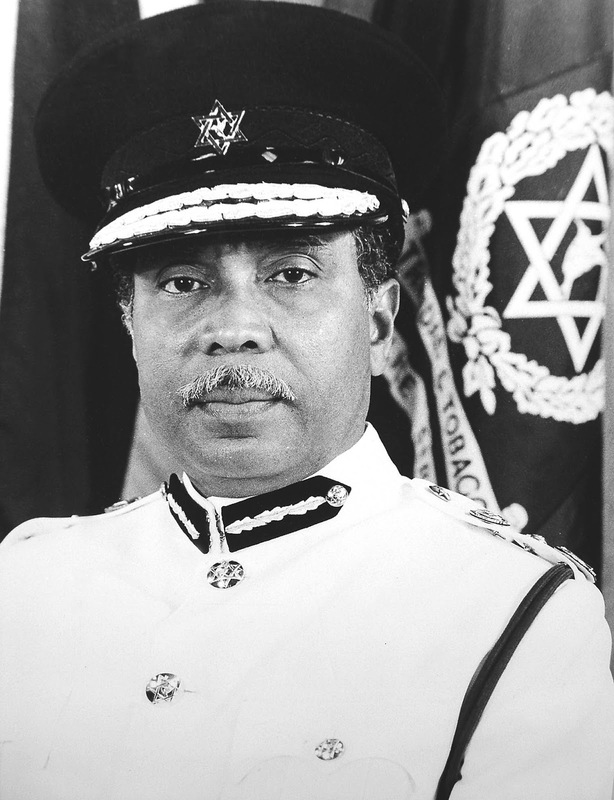 He was the first man of African descent to be appointed Commissioner of Police, serving from 1970 to 1973. 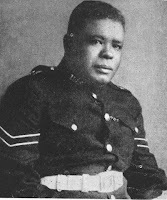 During this period of social upheaval in the black community the post of Commissioner would be filled by Deputy Commissioner of Police Claude Anthony “Tony” May. May, the son of former Inspector-General, Colonel George May, had, like former Commissioner Carr, grown up at St. James Barracks. The Special Branch had penetrated the Black Power movement and the Trinidad and Tobago Regiment. The leading personalties of the Black Power movement were Geddes Granger and Dave Darbeau. 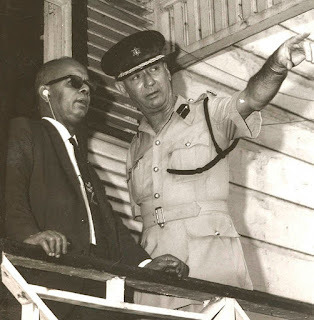 The Government, Prime Minister Dr. Eric Williams, had not lost trust in the Police Service, which was loyal to a man. 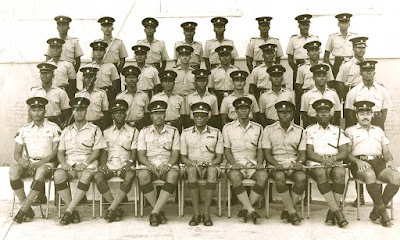 The Government was also aware that the Coast Guard, with its large composition of members of the former Police Marine Branch, was dependable and that its officer rank was loyal. The Black Power marches and speeches continued to April 20th, 1970. 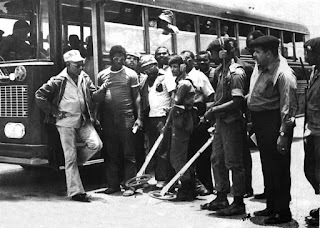 The declaration of a State of Emergency on 21st April, when Granger and some of his lieutenants in N.J.A.C. were detained, brought to an end what was obviously a lawless state of affairs. These detentions marked the end of that phase of N.J.A.C.’s strategy; their objective to bring down the Government of Trinidad and Tobago had failed. Bernard had knowledge that “N.J.A.C. 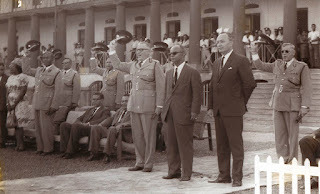 was dominated by people with communist ideas and ideology.” The Police Service had, without a doubt, saved Trinidad and Tobago from what could have amounted to be a foreign power intervention, very likely, according to Kelshall, from Venezuela, or a civil war with all the attendant miseries and violent deaths. from His Excellency, Sir Solomon Hochoy, Governor General of Trinidad. Instructors and newly graduated constables. Eustace Bernard plainly states, “The numerical strength of the Service was clearly not sufficient to enable it to work a forty four hour week and to render an efficient 24 hour service to the public. To reduce police working hours to forty per week was, therefore, looking for even greater chaos. The Commissioner of Police was not consulted before the agreement with the Police Association led by its general secretary, Inspector Rupert Arneaud was reached. However, before publication of the relevant regulations, the Minister of National Security, Mr. George Chambers, discussed the matter with me. I strenuously objected to the forty-four hour week, pointing out the detrimental effect it would have on the availability of policemen at stations, their presence on the streets and the capability of the police to respond to calls.” Bernard was supported in his views by members of the First Division as well as by past Commissioners James Reid and George Carr, and significantly the Acting Permanent Secretary in the Ministry of National Security, Mr. Teasly Taitt, to whom he wrote a report five months later, drawing to his attention the detrimental effect which the change to a forty-four hour week was having on efficiency, morale, discipline and ‘esprit de corps’ of the Service, the four essentials as he termed them. 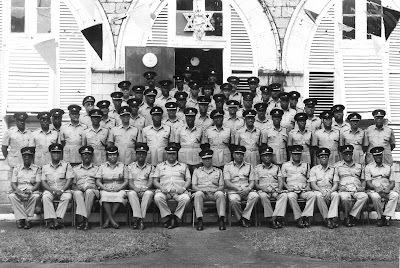 Sergeants and Instructors at the Police Barracks. courts. Commissioner Bernard was to report, “There has been a marked falling off in the attendance of court cases, in that court attendance interfered not only with the two compulsory days off, but also with time off in the eight hour day. I believe this reduction in police working hours has been the root cause of police inefficiency,” Bernard reported. He argued that the authorised strength of the Service was two thousand eight hundred and eighty six in 1971. “If one were to divide this number into four shifts, each shift would be made up of seven hundred and twenty one men, thus the new regulations have placed into actual service, at any one time, only seven hundred and twenty one men to carry out all the functions of the Police Service.” And this was not taking into account officers and men who could be on leave, abroad or ill, thus reducing the quantum of on duty police by a considerable amount. 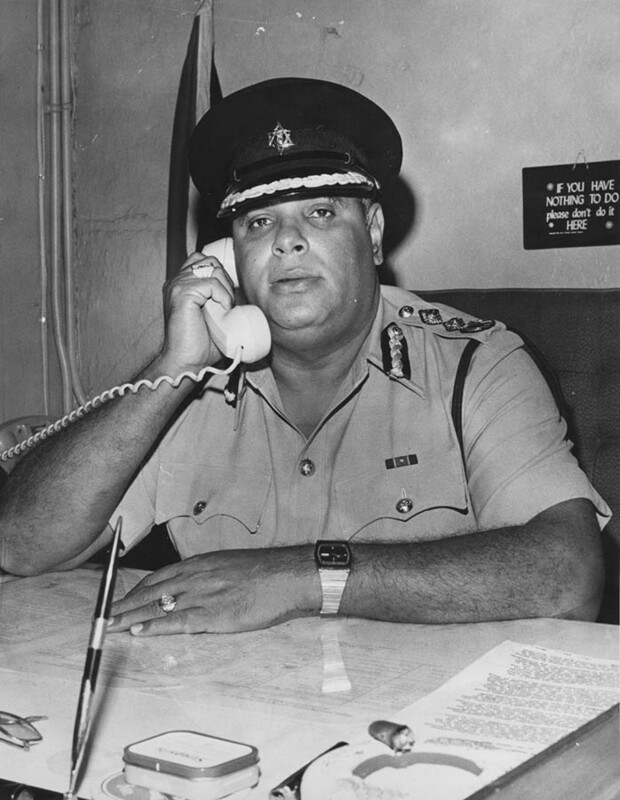 “I told him if we were to take fifteen percent of the seven hundred and twenty one men as being on leave in any one year and another five per cent as being sick, there will only be five hundred and seventy seven men to run the entire Trinidad and Tobago Police Service at any one time in any one year. (Protective Services) in the Ministry of National Security. being away from the country. He goes on to describe what was already happening and predicted what would be the future experiences of the public for several years. “This reduction has had a tremendous detrimental effect on the entire Service. There was no one at stations for considerable periods, either by day or by night, other than the sentry. Reports of accidents, burglaries and serious crimes could not be investigated until some days later. In some instances, the inspectors have had to go out to investigate traffic accidents. Without the appropriate increase in trained personnel in all ranks, this was a very serious blow to the effectiveness of the Police Service, made critical, by the evidence being collected by Special Branch on the increase of illicit drugs and guns entering the country and, the extent of subversive activities being conducted by persons of interest to the police. the elected government, as well as an attempted mutiny of the Trinidad and Tobago Regiment, that the very same government that had been saved by the Police Service, would countenance an act that would effectively undermine the discipline and weaken the effectiveness of the very Police Service that had saved it, as well as the country, from anarchy. on the use of metal detectors. The change in working hours had created circumstances that could only be described as very serious with regard to conflicts of interest. Loyalty to the Service and performance of duty were conflicted with the appearance of illicit drugs, with personal, family and community concerns. The forty hour work week especially affected the probationer and those who had recently joined the Service: compromised in their loyalty, they were often forced to turn a blind eye to what they saw taking place in their homes, amongst their friends and in the community that they grew up in. Ironically the number of arrest for possession of marijuana increased dramatically generating long trial delays and overcrowding in the Remand Yard. As marijuana became the popular drug for recreation and anti-social behaviour, it was only a matter of time before the real purpose of its introduction began to manifest, which was to facilitate the importation and transshipment cocaine, accommodate money laundering and the introduction of guns and ammunition. White-collar crime would take root in certain businesses and in several government departments so as to facilitate the drug trade. The forty hour work week, introduced by the Welfare Association and accepted and implemented by the government, as sudden as it was, served to create a breakdown in discipline and compromised loyalty to the Service. It generated, in the long run, the backlog of cases in the courts and eventually the overcrowding and near collapse of the prison system where, in the remand yards, a university for criminals was created. These events were further exacerbated by the emigration of some one hundred and ten thousand people who left Trinidad and Tobago from 1960 to 1970; about one tenth of the population. In the previous period, 1950 to 1960, just four thousand people had emigrated. This emigration left many children and young people without parents, exemplars and proper guidance. Without a doubt the society was undergoing a fundamental change, an exodus, in fact, as in the following twenty years, over one hundred seventy thousand persons would leave Trinidad and Tobago to seek their fortunes abroad, producing a generation of the so called “barrel children”. Children whose only contact with their parents were the barrels of gifts received by them from time to time. To have an idea of what segment of the population that was in the majority of this exodus is to note that carnivals appeared in Brooklyn, London, and in Toronto, as well as in other places. The corollary to the emigration phenomenon was immigration. This saw about the same amount of people, mostly from the other islands, come to this country, as those who had left it. These lived increasingly in scattered squatter communes along the east-west corridor and in the older neglected and impoverished areas, both in the east and to the north-west of the city of Port-of-Spain. In 1971, in the aftermath of the failed N.J.A.C./Black Power uprising that had attempted to overthrow the government and the mutiny of the Trinidad and Tobago Defense Force, a group of N.J.A.C. followers continued to meet so as to arrive at a new strategy that would achieve their original goals. Bernard writes, “He, Bedeau, unlike the non-achievers was, by comparison, well qualified having got his ‘A’ levels and was employed. He was their age, articulate, persuasive, mild of temperament, but a born revolutionary.” He provided the group with books and instructions on revolutionary tactics. The other influential members of this core group was Guy Harewood, who came from an upper-middle-class background, and Brian Jeffers, a drug pusher and petty criminal. It was agreed that N.J.A.C.had failed because of the absence of military muscle. The ‘Brothers’, as they called themselves, decided to create an organisation that would seize the country by force of arms, a notion that was fortified by the number of former regiment men who were in sympathy with their ideals. They would call the organisation the National United Freedom Fighters, N.U.F.F. Mr. Tony May during the N.U.F.F. insurgency. 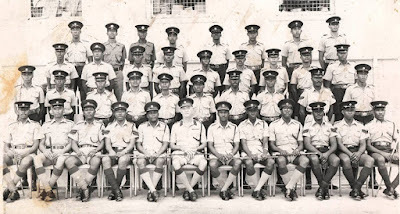 From 1971 to 1975 the Police, first under the command of Commissioner Bernard and from 1973 to 1978 under the command of Commissioner May, engaged the island’s first and to this day only guerrilla fighter force. The National United Freedom Fighters, N.U.F.F., evolved into a highly organised and very motivated band of young men and women who staged several bank robberies and holdups, executed acts of sabotage against vital installations, bombed homes of Regiment Officers, ambushed police patrols, shot and killed civilians, destroyed police stations, attempted the murder of Captain David Bloom, and killed four policemen, wounding several others in the course of their duties. Those murdered were: Constable McDonald Pritchard, Constable Austin Sankar, Corporal Bascombe, and Corporal Andrew Britto. In the face of almost daily assassination attempts and brazen robberies, all coming in the wake of the harrowing period of the N.J.A.C./Black Power uprising and attempted mutiny by elements of the Defense Force, it became clear that a new and challenging period was upon the Service. passing out parade, St James Barracks. Because the earliest actions undertaken by the group were burglaries and break-ins and a daring bank robbery, Superintendent Randolph Burroughs, of the Robbery Squad, was put on full time investigation of these reports by Commissioner Bernard and Special Branch was asked to assist. 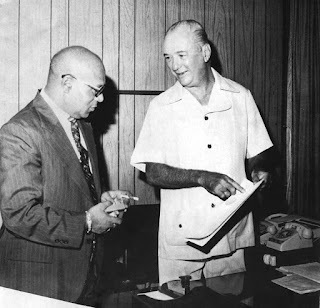 In 1972 after a shootout with Police and a party of well armed and obviously motivated men on the Blanchisseuse Road, Commissioner Bernard relieved Superintendent Burroughs of all other duties and directed that he concentrate on the apprehension of those responsible for what was feared to be an incipient guerrilla movement that was being motivated and guided by outside interest that had as their intention the overthrow of the Government. It was feared that this situation could grow and evolve into a full scale conflict, that in the worsening financial state of the country (this was before the oil boom of 1973) would tend to attract those who had been motivated by the Black Power movement, dissidents, Cuba inspired trade unionists, former members of the Regiment, criminals, the generally disaffected, the impoverished, the desperate and even the idealist. Commissioner of Police Randolph Burroughs was awarded the Trinity Cross. He seen here with Commodore Mervyn Williams also a recipient. During the following three to four years, the Flying Squad was engaged in running battles with the N.U.F.F. that took place in forested areas of the northern range, in towns and in fact across the country. The robberies of banks and other places provided the N.U.F.F. with cash, but it became obvious to the police that they were being guided and supplied increasingly with sophisticated weapons, cocaine and marijuana. 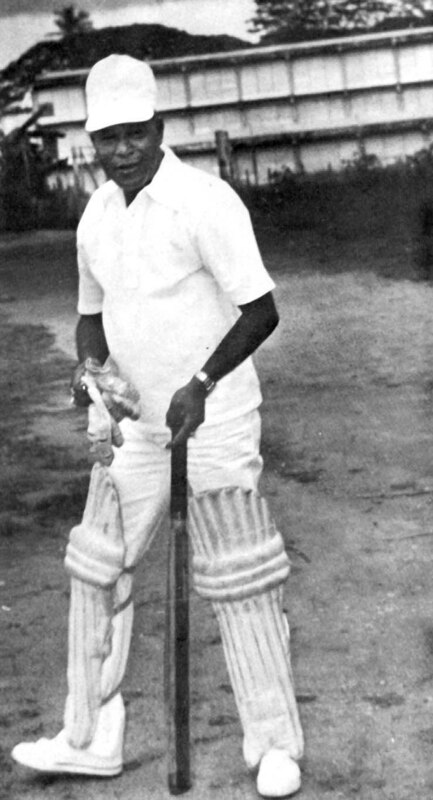 Randolph Burroughs as opening batsman. Commissioner of Police Randolph Burroughs’ term of office came to an end in 1987. He was succeeded by Commissioner Louis Jim Rodriguez. In 1990, partly as a result of political indecisiveness, a breakdown in communications and against a protracted downturn in the economy, yet another insurgent group arose. Its alleged purpose was to resist political chicanery, wanton social injustice and exploitation of the disadvantaged. Muslim extremists were able to train and indoctrinate a membership, evade detection and import a quantity of explosives, arms and ammunition. 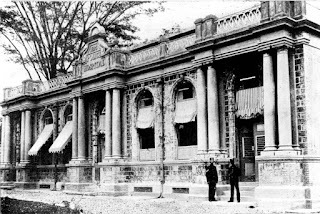 They destroyed by fire the Police Headquarters on St. Vincent Street, Port-of-Spain, murdering the sentry on duty, while holding the members of the Parliament of Trinidad and Tobago hostage and causing multiple deaths in another attempt to overthrow an elected government. 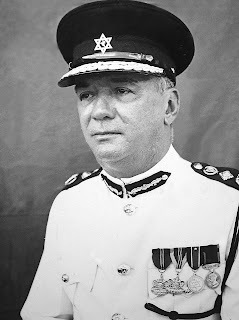 These events took place in the first year of Commissioner of Police Jules Bernard taking office. standing behind the irate civilian. 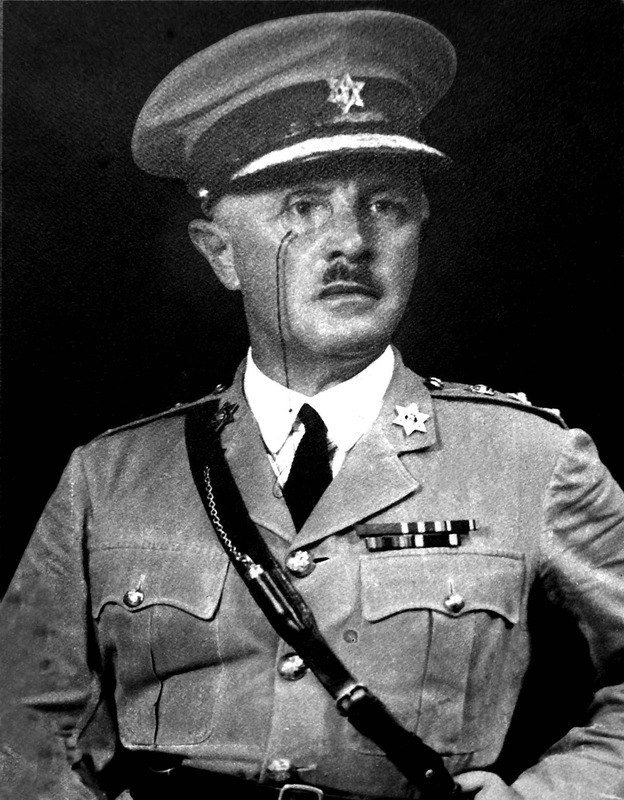 of Police Jules Bernard, his successor. I also grew up in St.James' Barracks, and thoroughly enjoyed reading this, and seeing so many familiar names and faces. Cole "Buster" Beadon, son of Lt. Col. Eric Beadon Beadon, Commissioner 1949 - 62. Great history of the Police Service. It really brought back memories and love it. WOW! Thank you for that journey into our history. A very excellent read and a delightful experience. Very glad i came across your blog. Well Done!! !